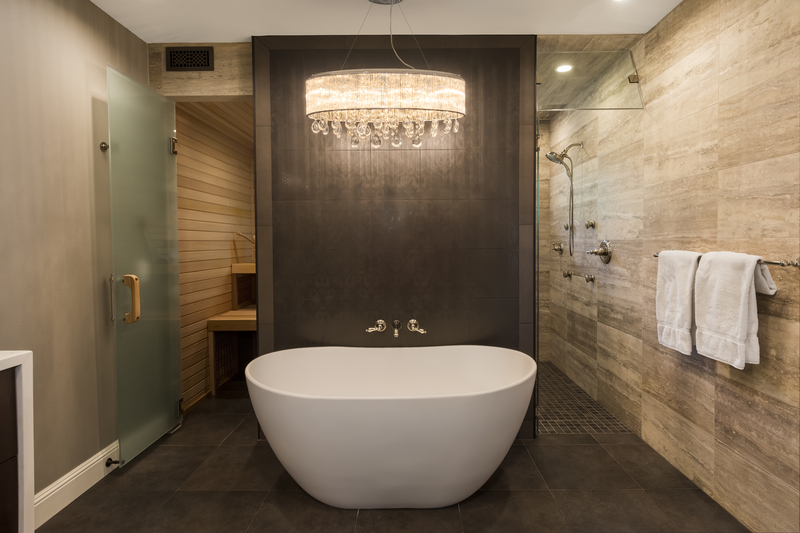 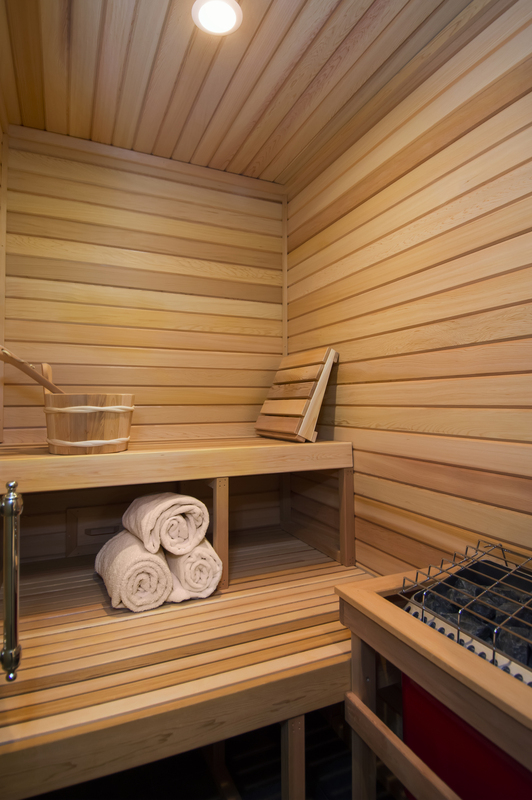 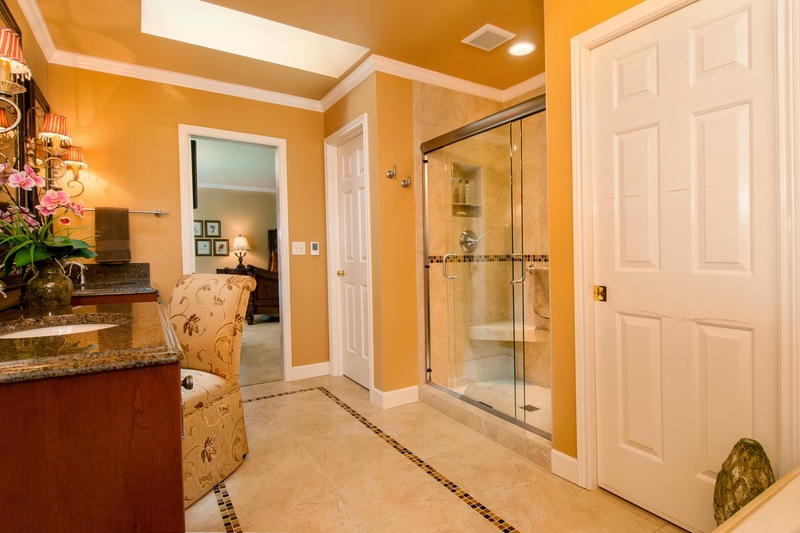 This luxury bathroom features a sauna, steam shower, and soaking tub. 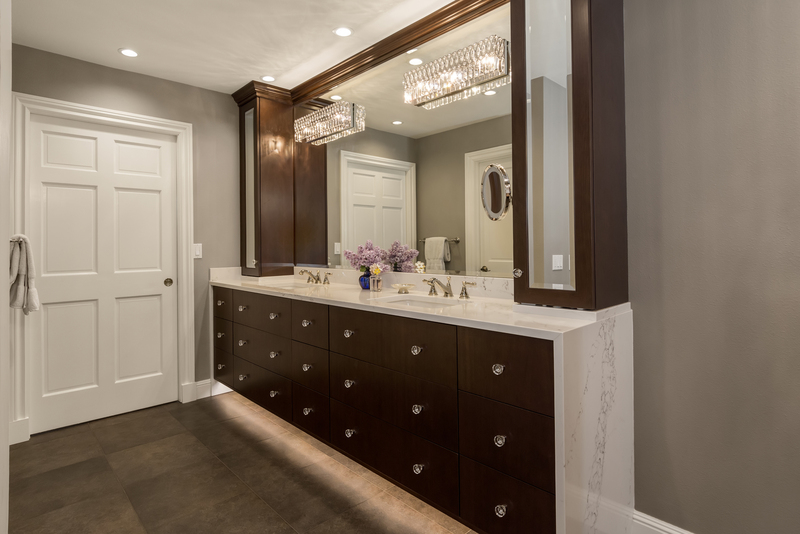 Exquisite materials include honed travertine tile, marble-like quartz, and custom wood cabinetry that put the finishing touches on this master bathroom. 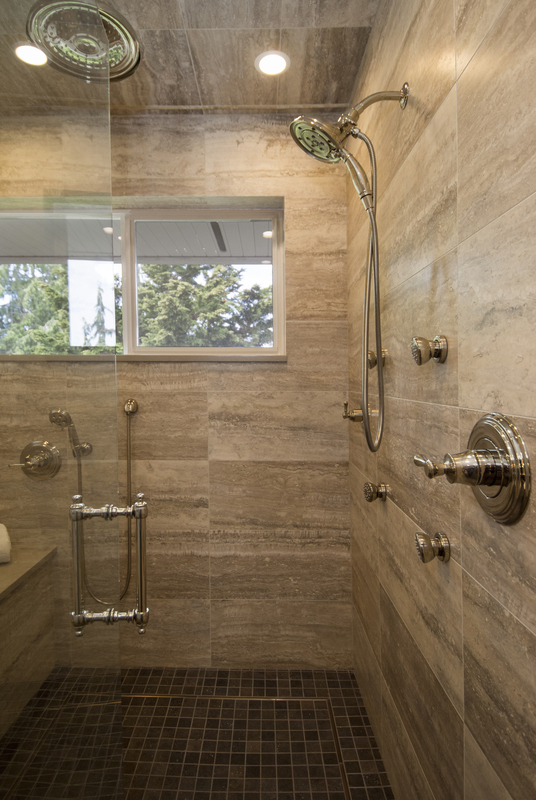 In this classic master bathroom with a sizable shower and freestanding soaking tub, the most striking feature of the space is the delicate and unique tile work. 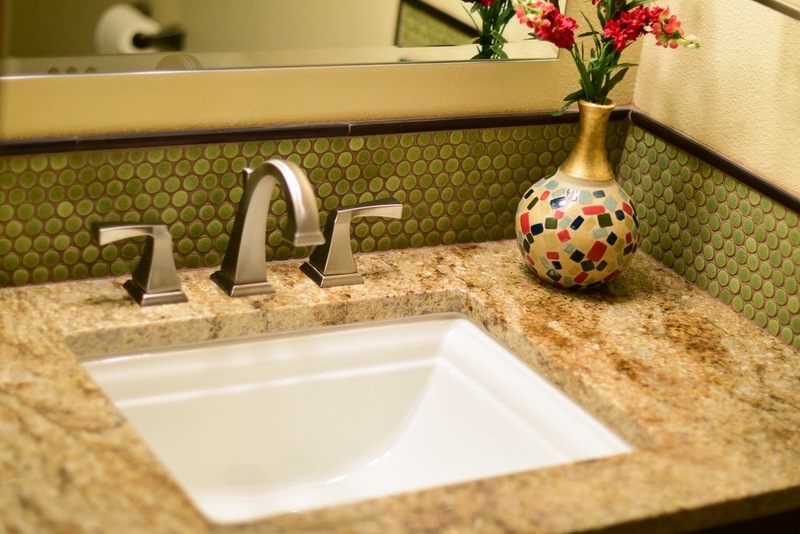 Stone pebbles, carefully placed one-by-one create an integrated backsplash that is timeless and striking. 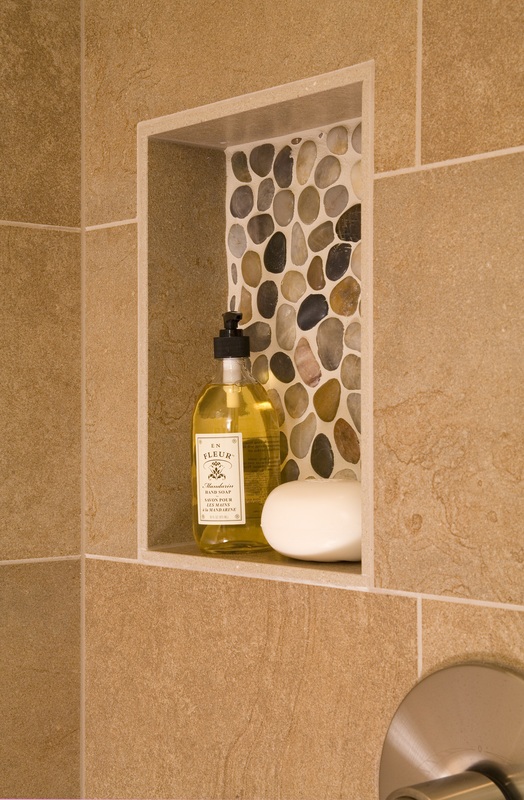 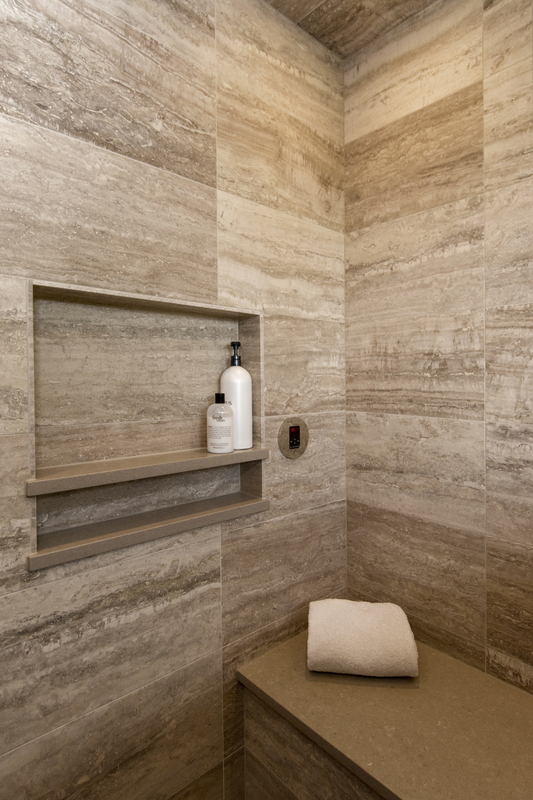 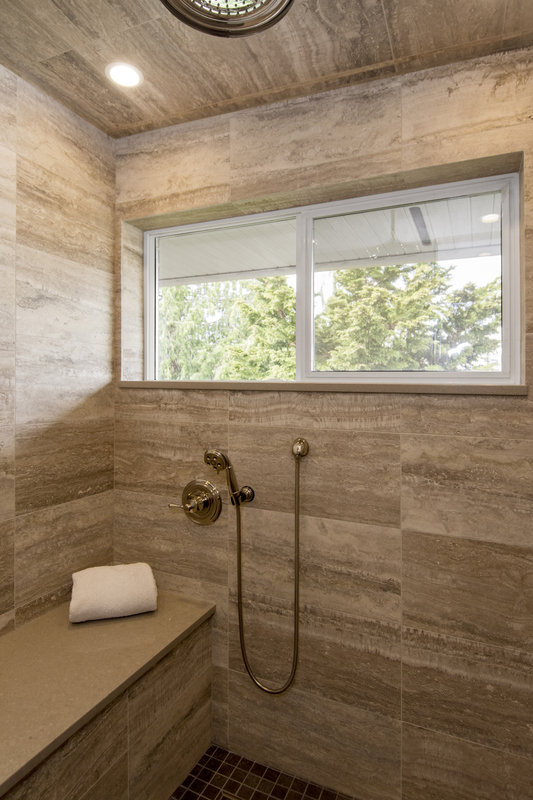 The pebble is repeated in the recessed shower niche to underscore the intricacy of the design. 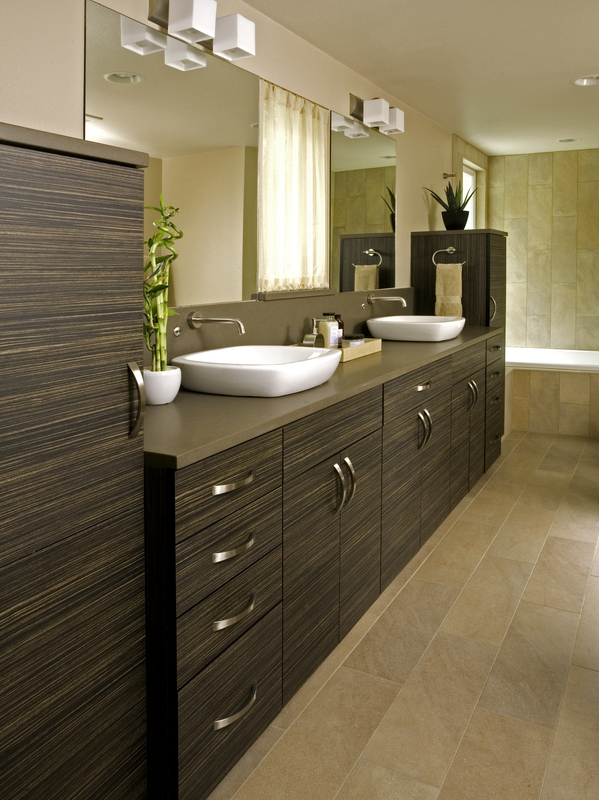 Transitional design is about the balance of classic and modern and this projectexpertly accomplishes that. 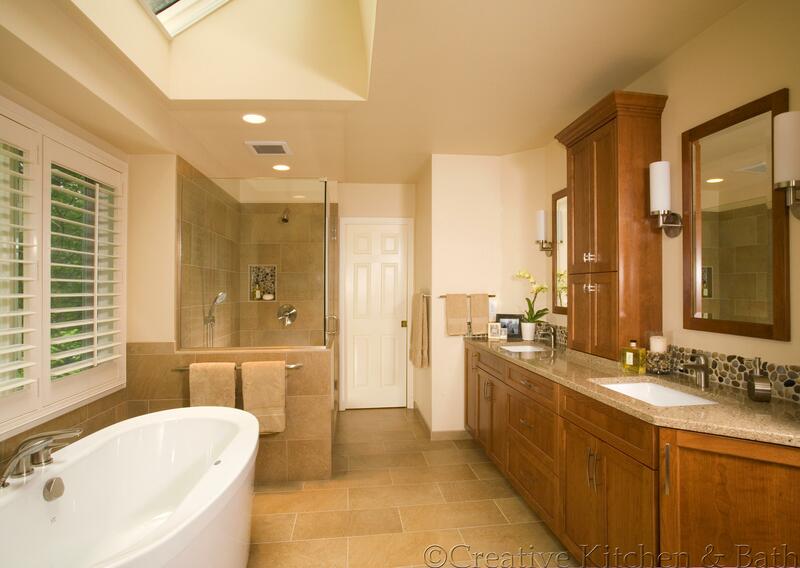 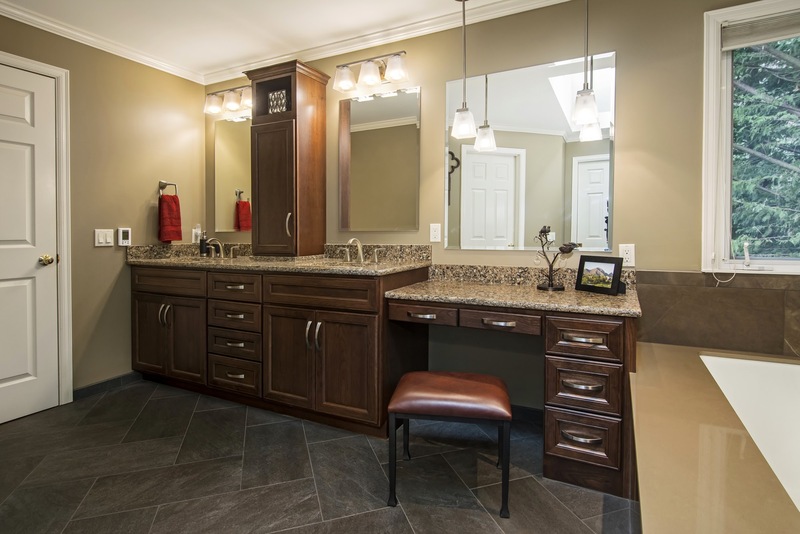 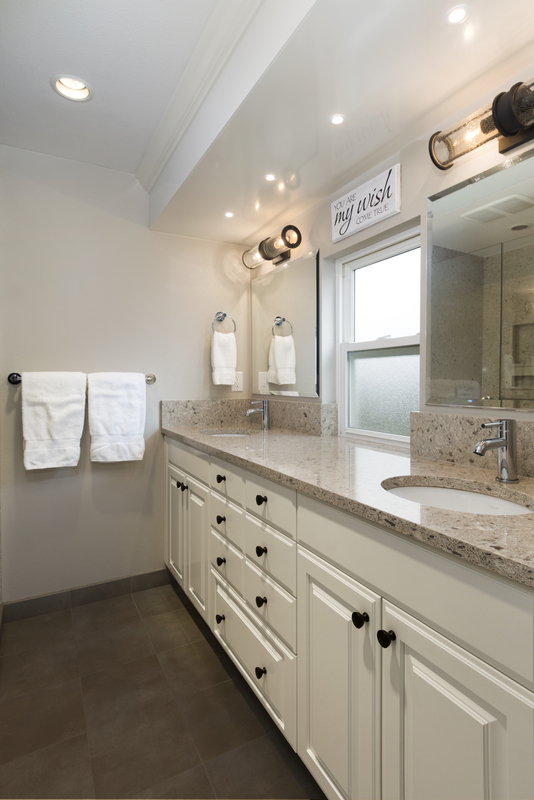 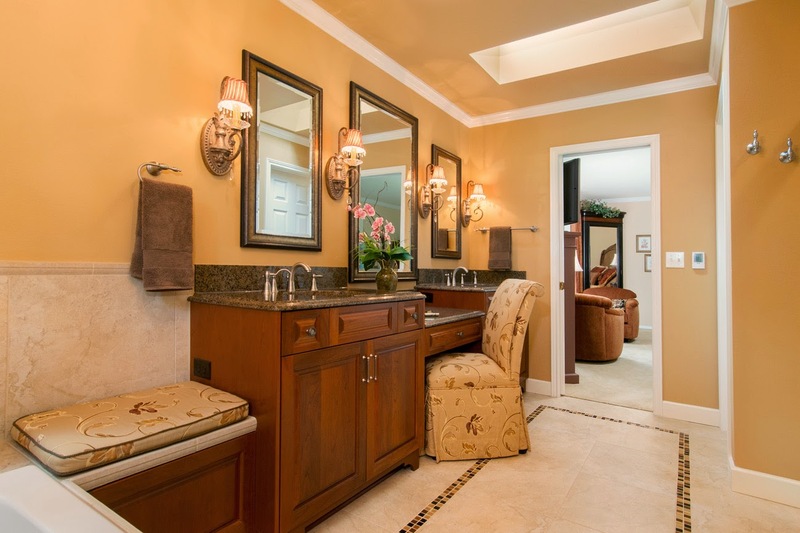 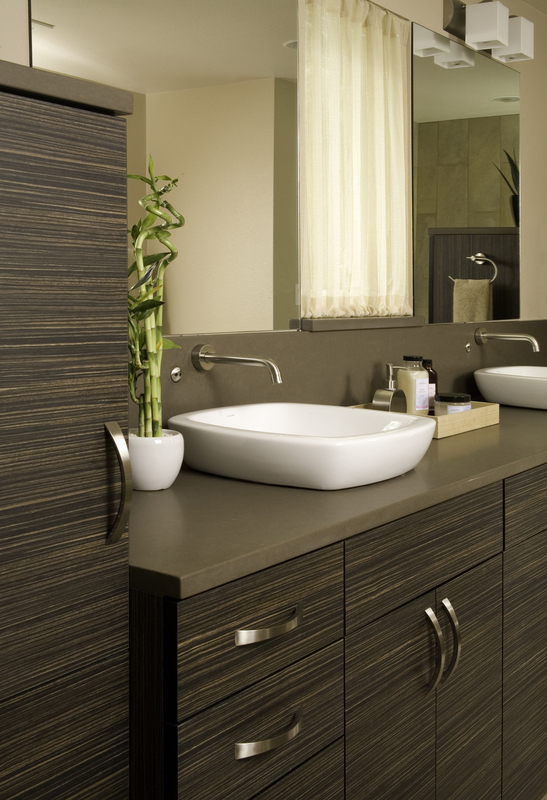 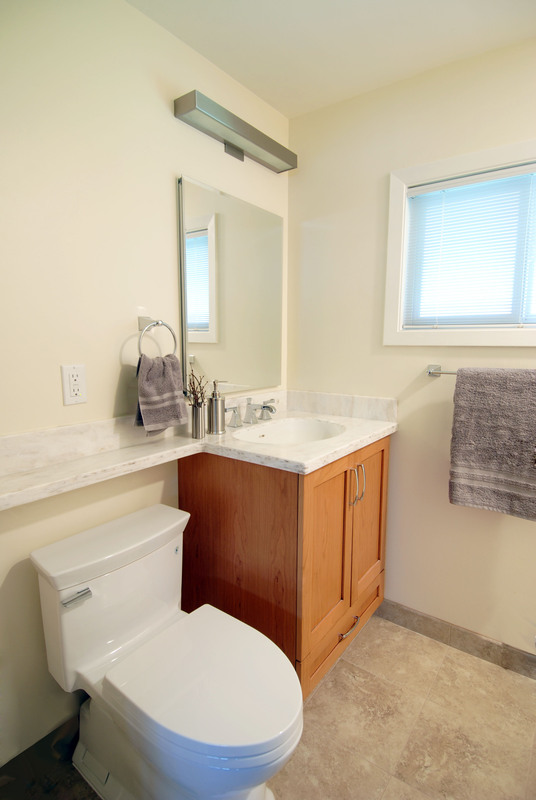 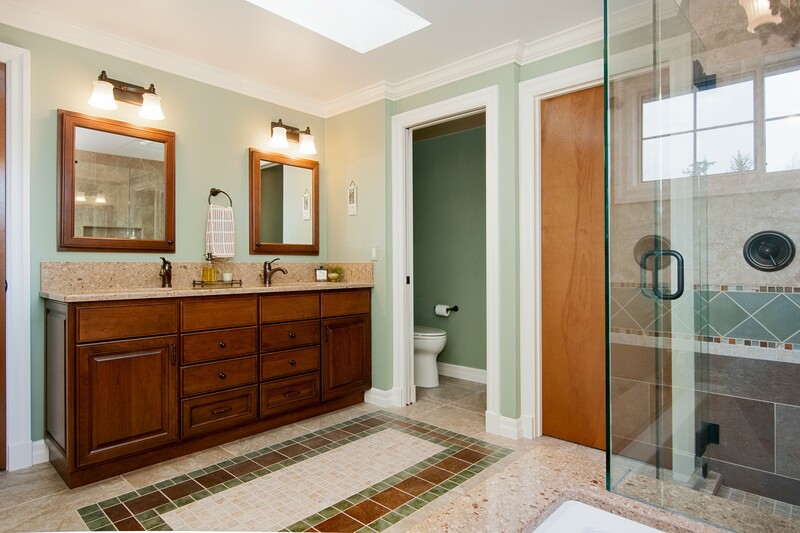 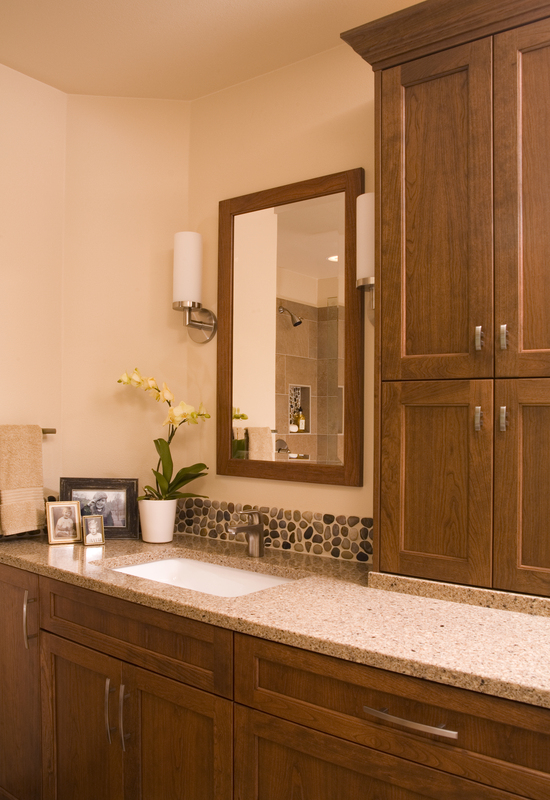 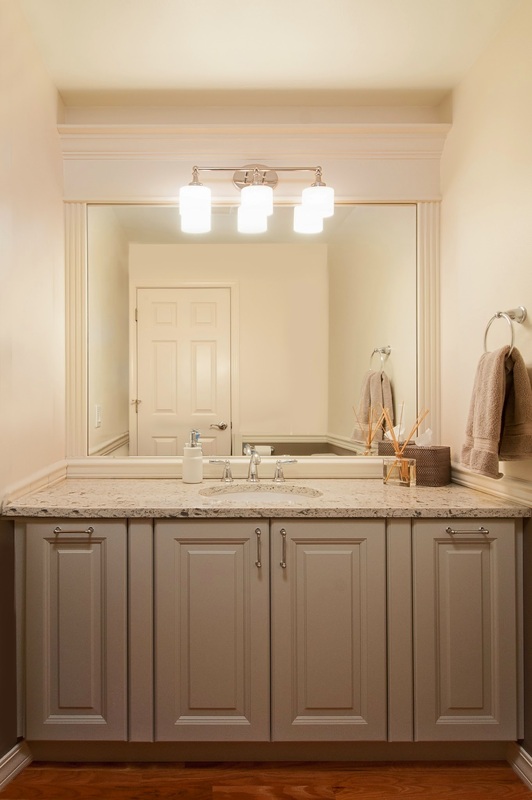 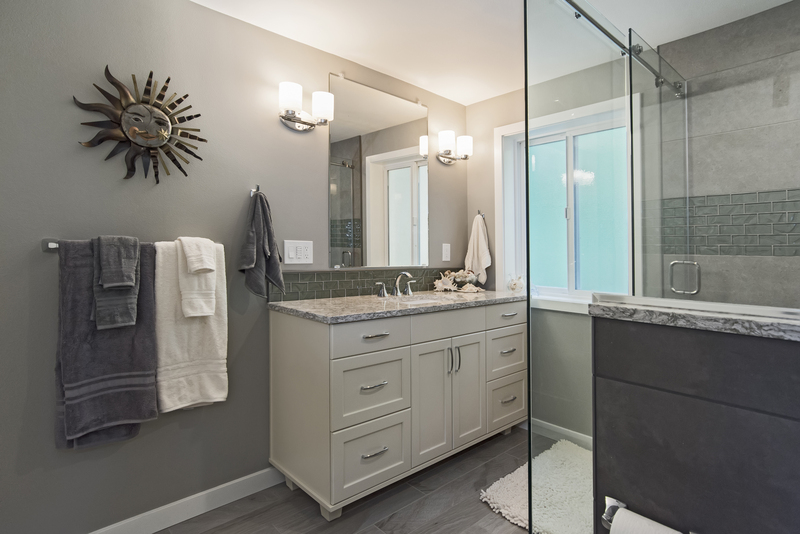 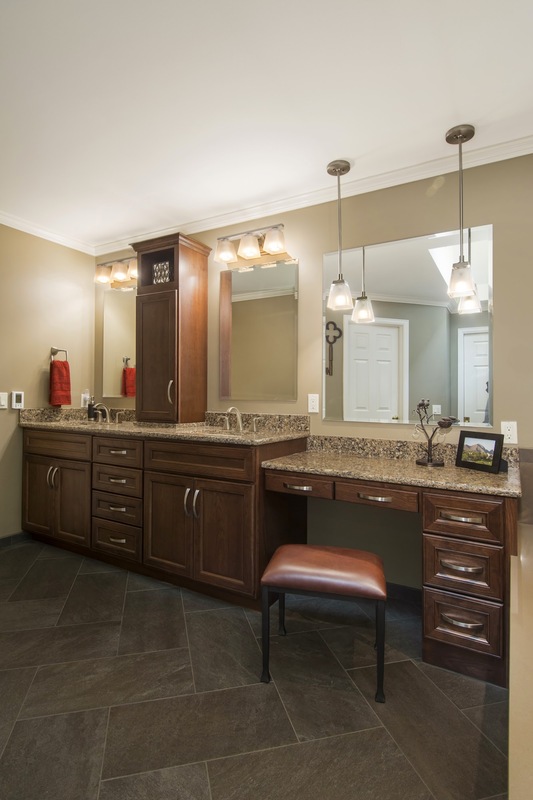 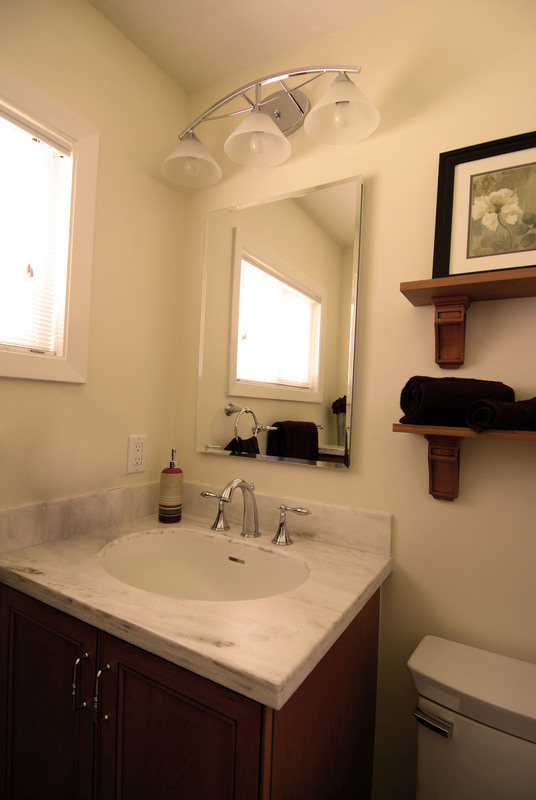 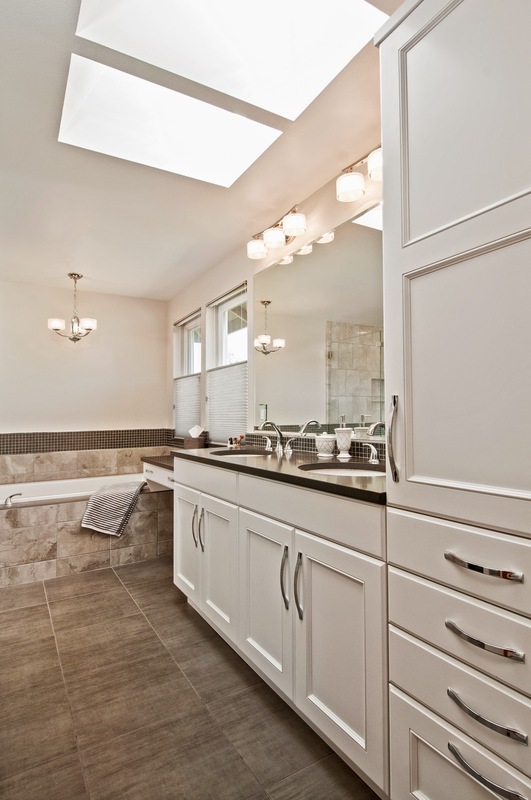 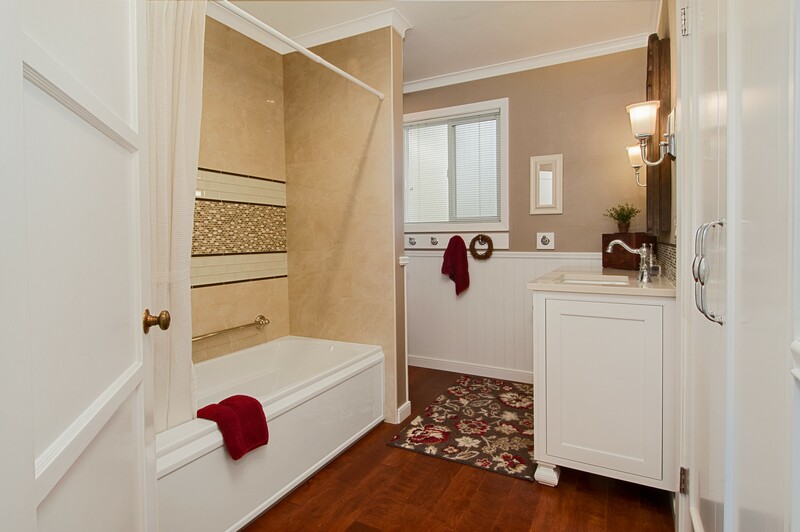 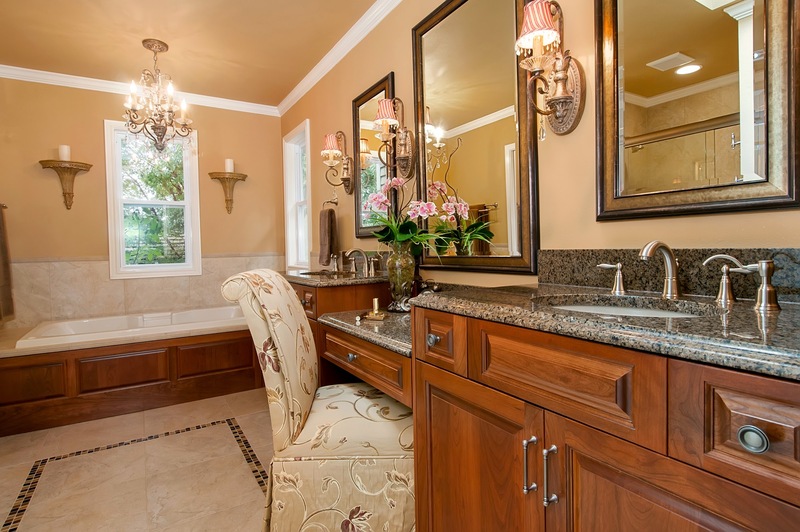 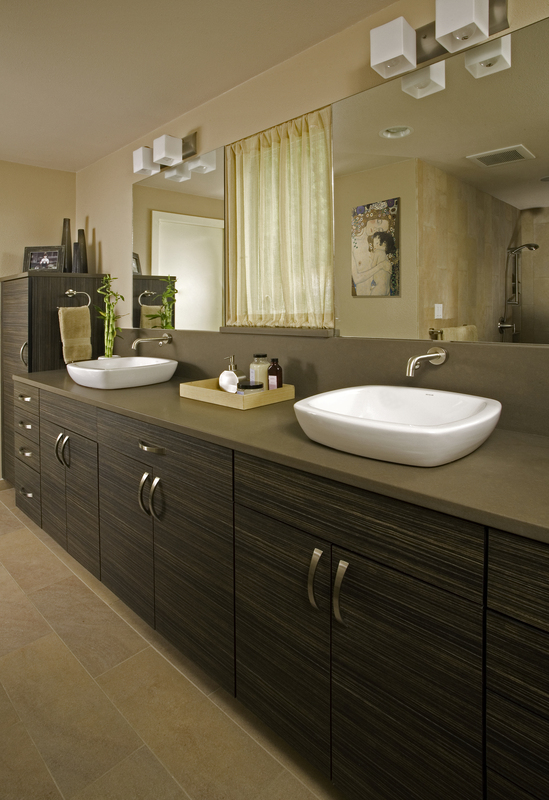 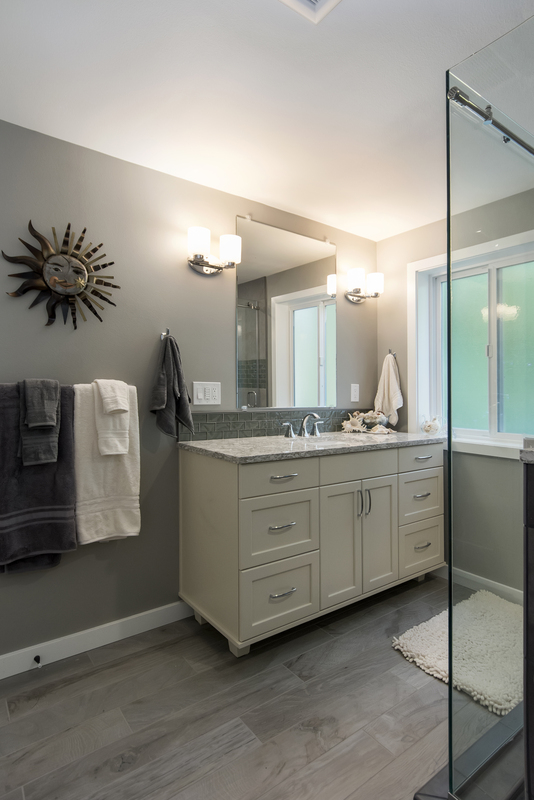 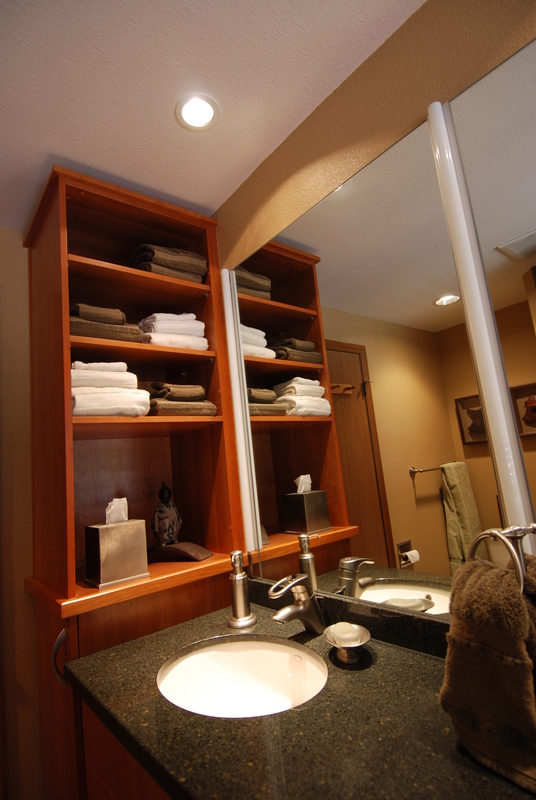 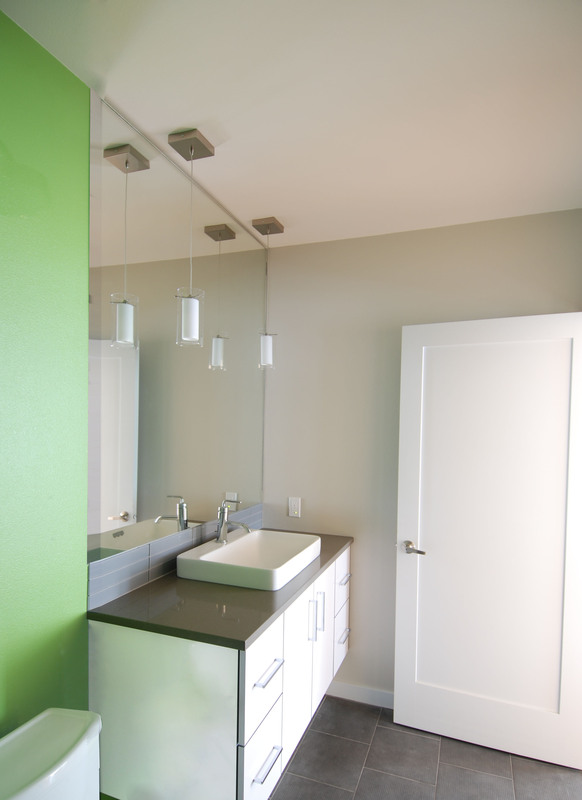 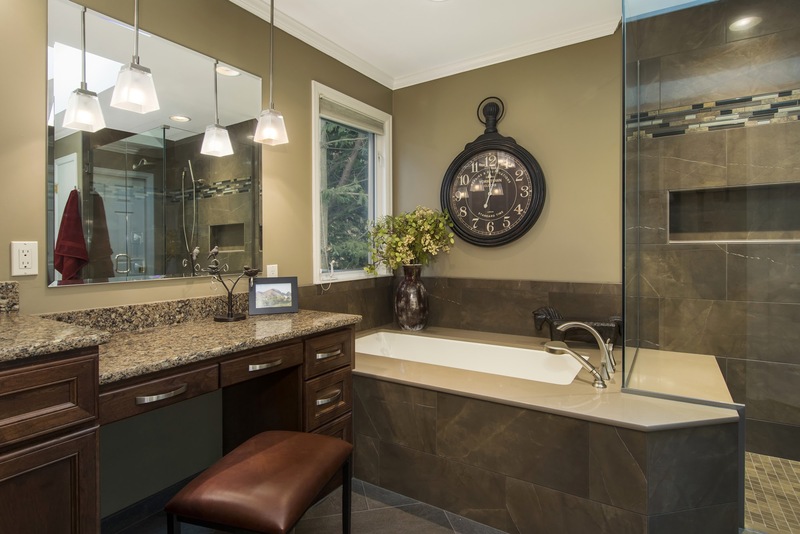 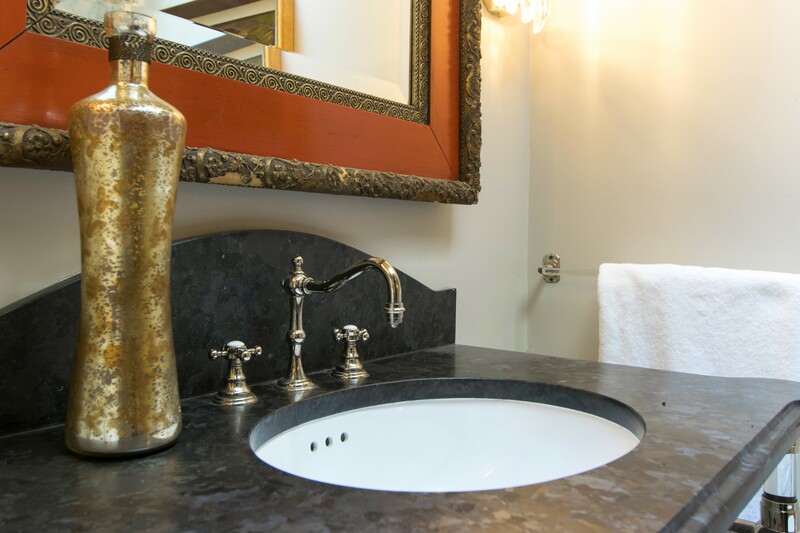 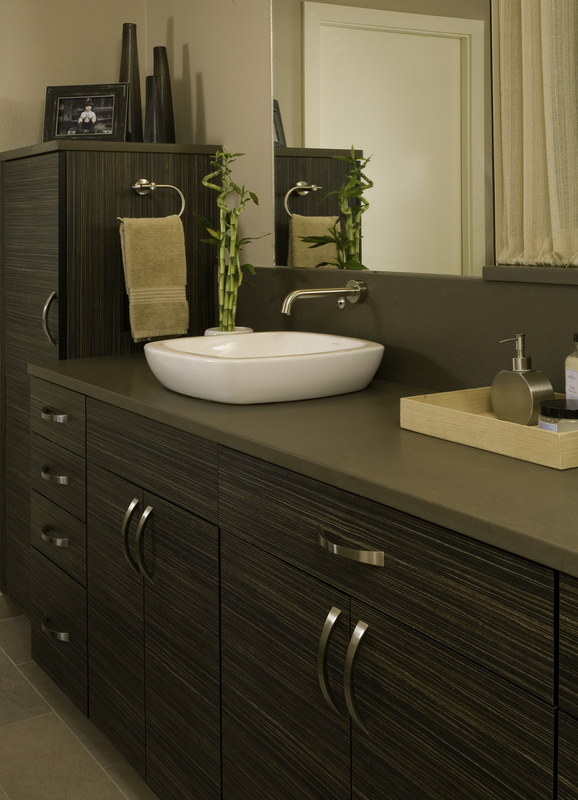 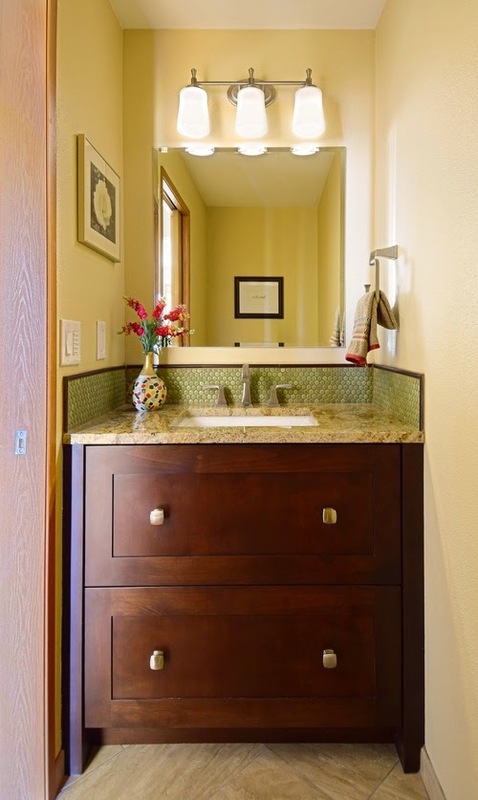 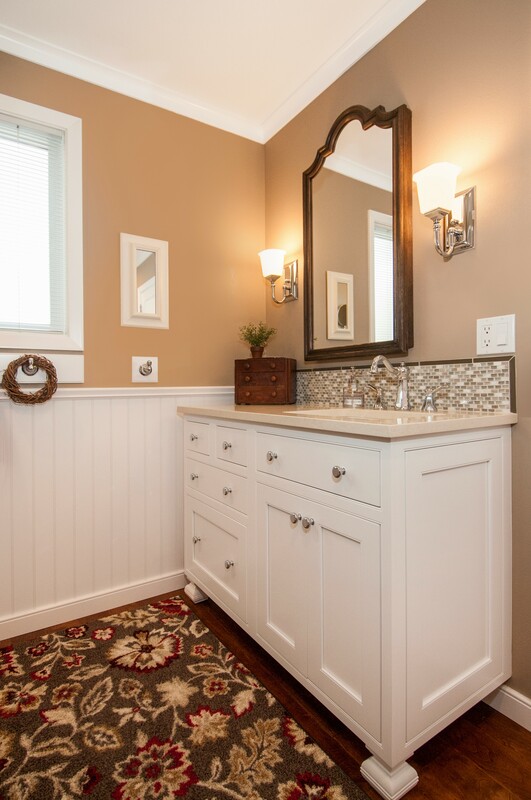 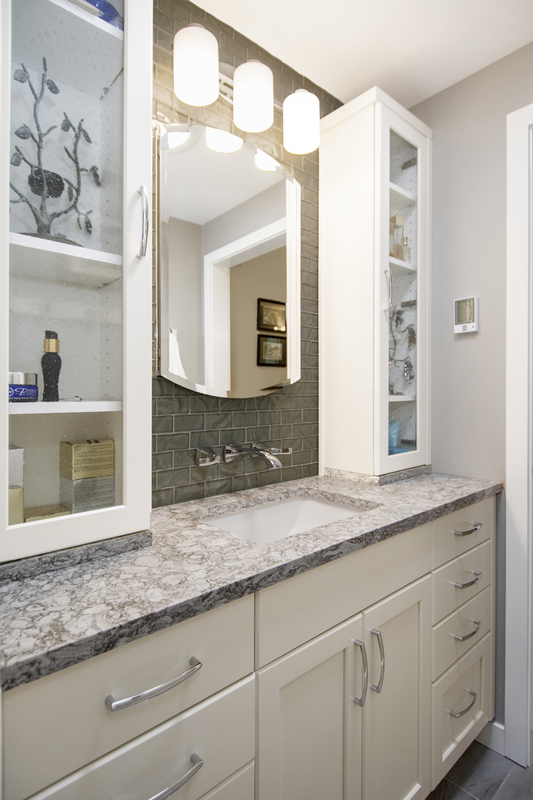 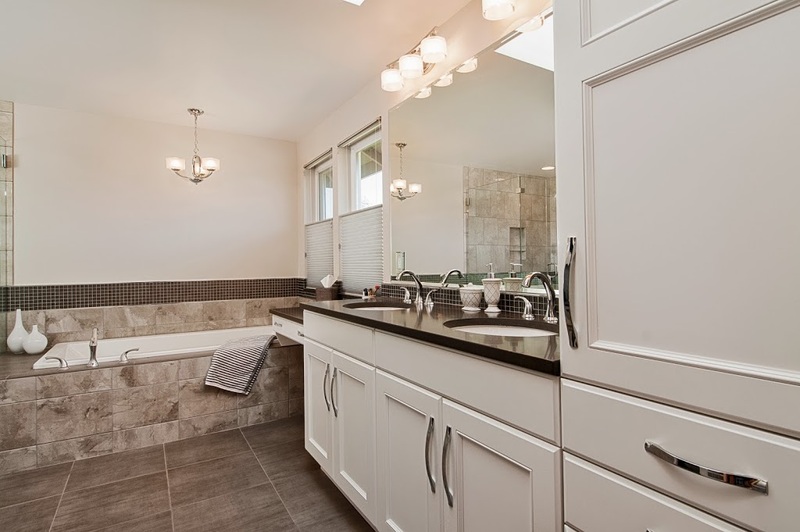 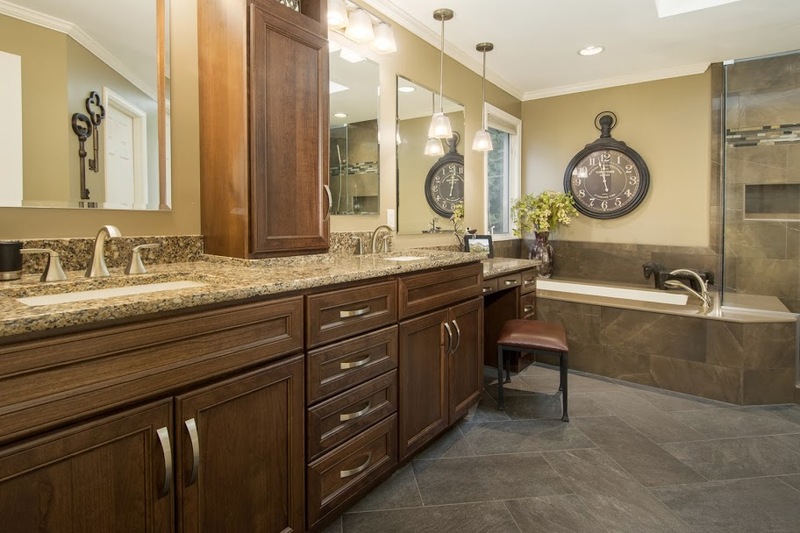 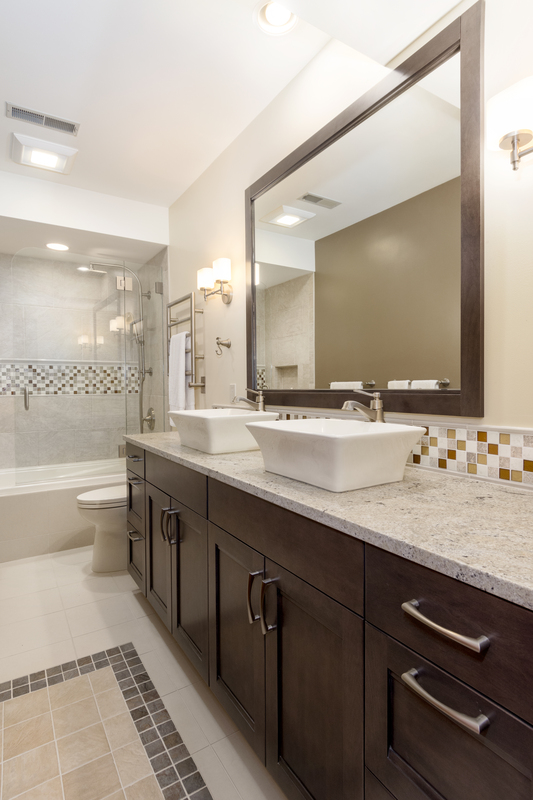 The master bathroom is upgraded with contemporary finishes and fixtures. 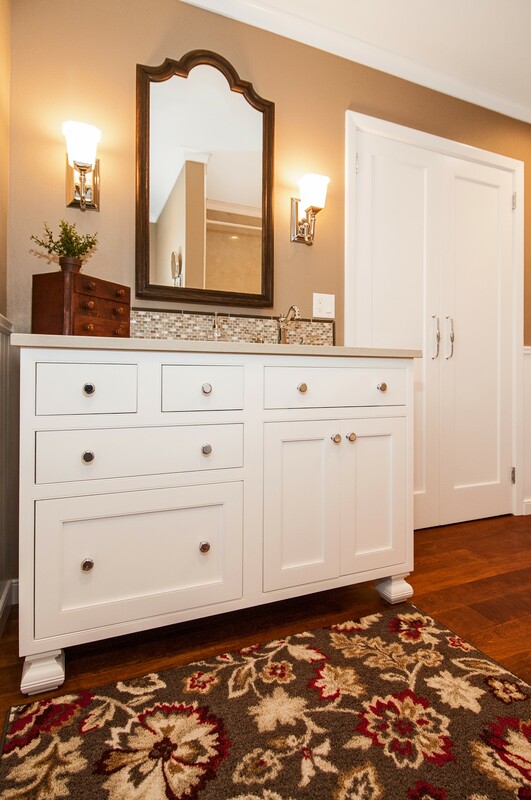 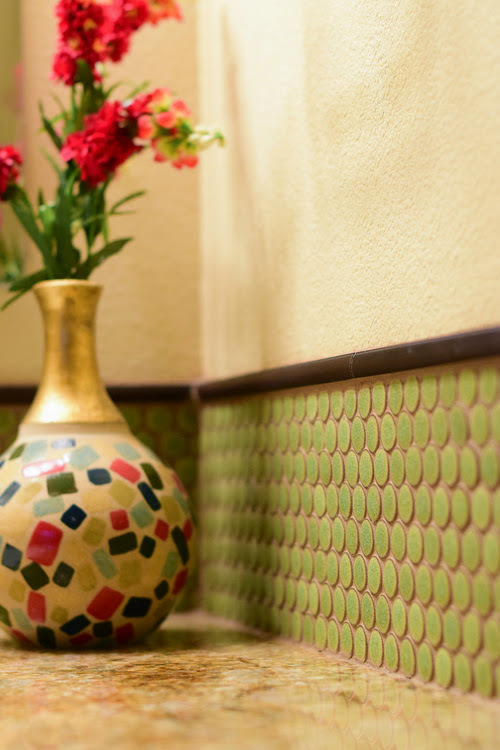 Accent tile and touches of fine accessories create a classic feel. 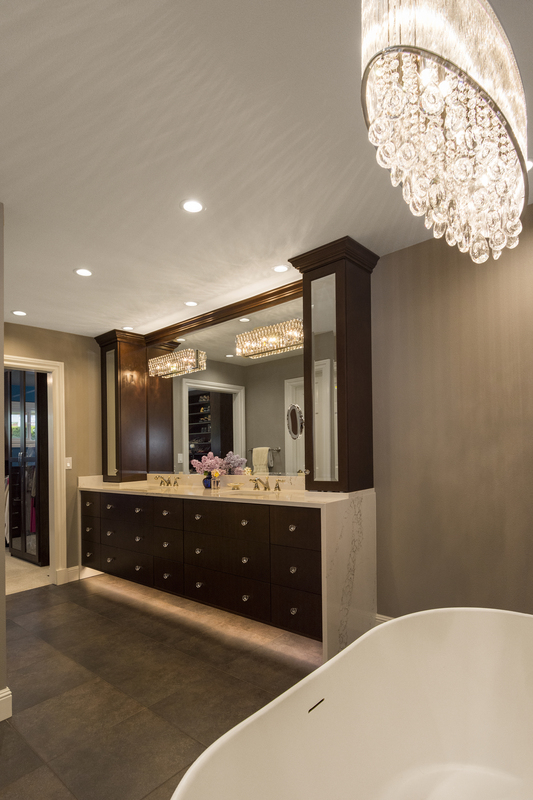 This master bathroom showcases traditional detailing in every aspect of the lighting, fixtures, cabinetry, tile and furnishings. 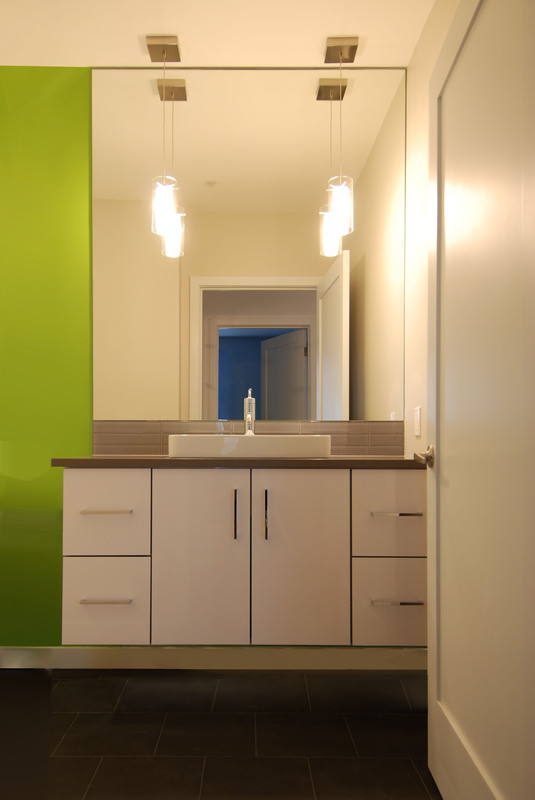 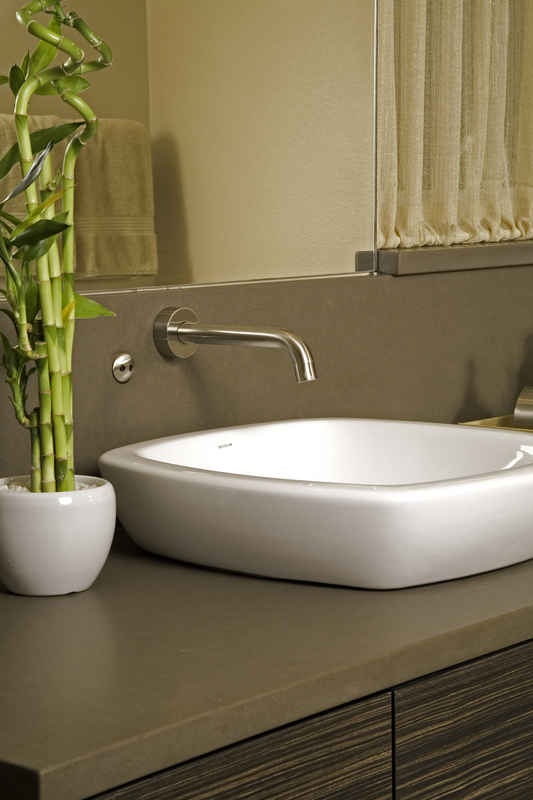 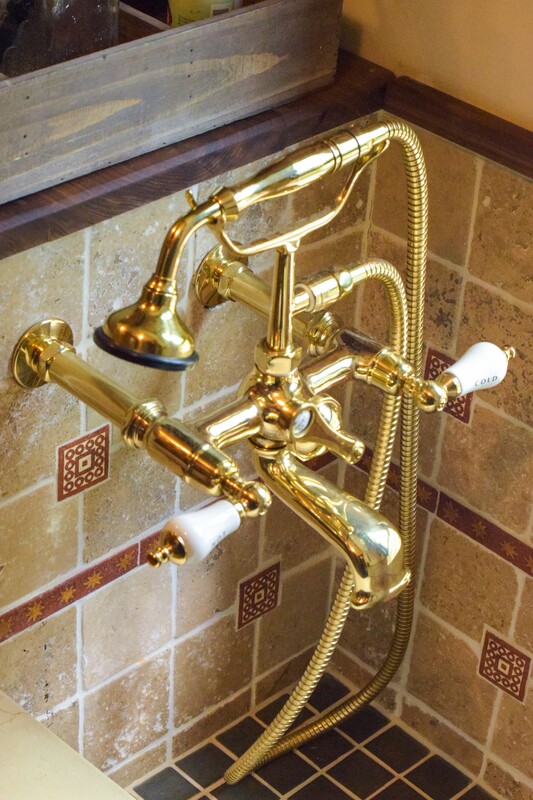 The beauty of this design is about the cohesion of fixtures and finishes. 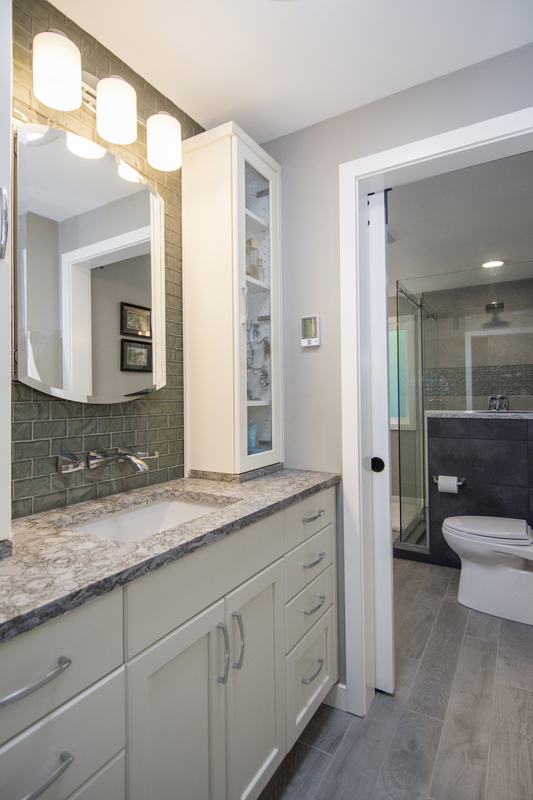 Pulling everything together, this master bathroom feels increasingly spacious because of the flow of materials from one area to the next. 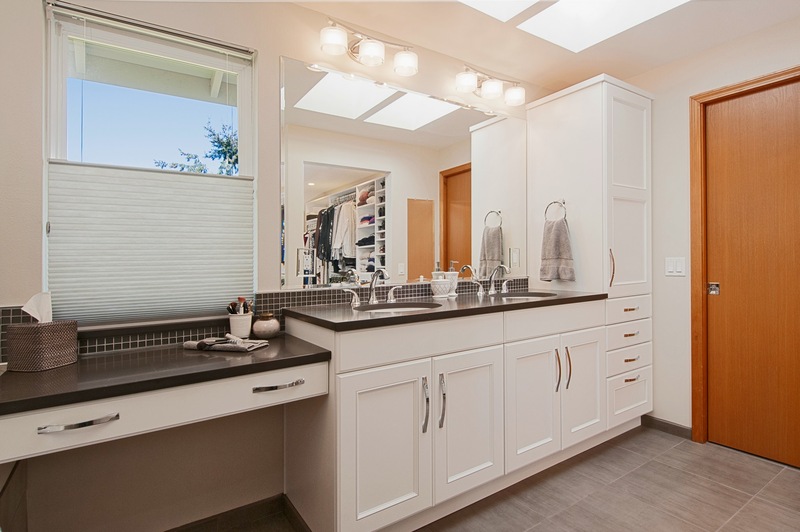 Maximizing space, the double-sink vanity, make-up station, soaking bathtub and large shower are perfectly fit to the space. 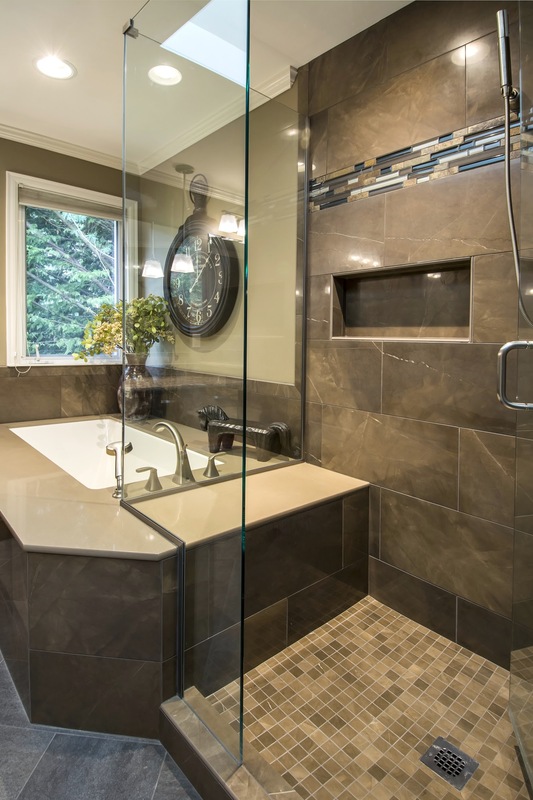 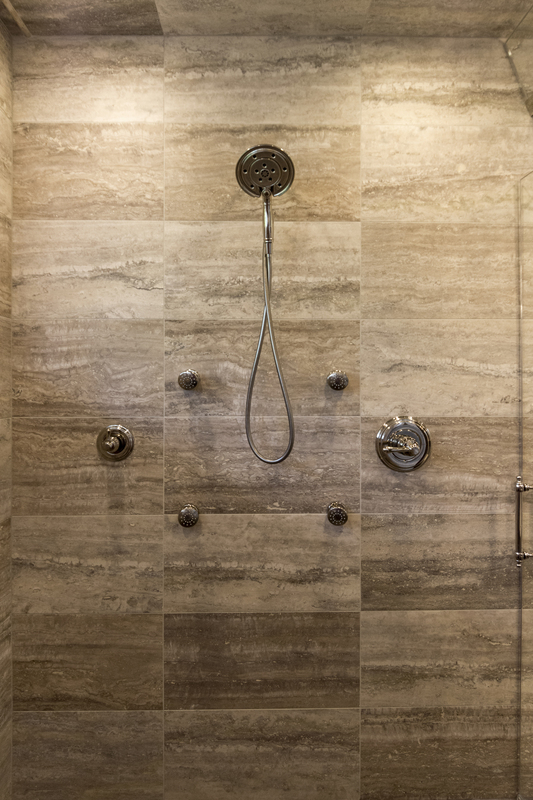 Tile is an ideal material for bathroom use because of water-proof properties, durability, and the variety of stylistic options. 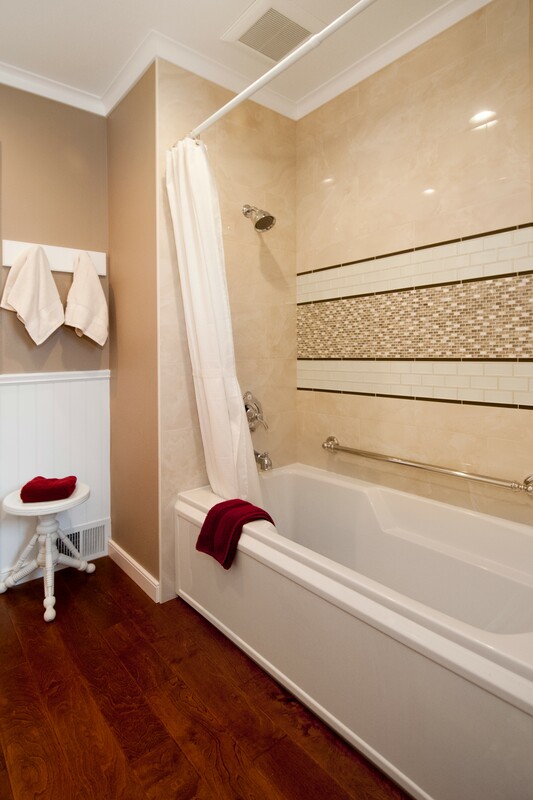 This master bathroom is all about using tile to highlight spaces and create a unique and beautiful aesthetic. 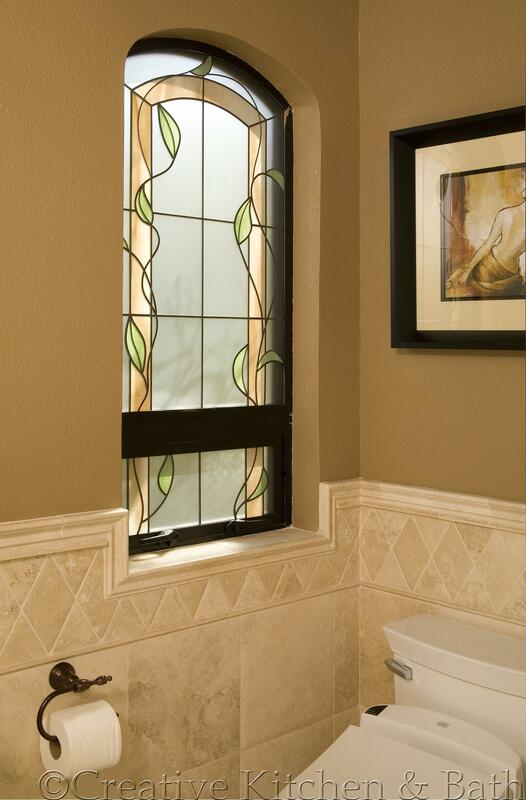 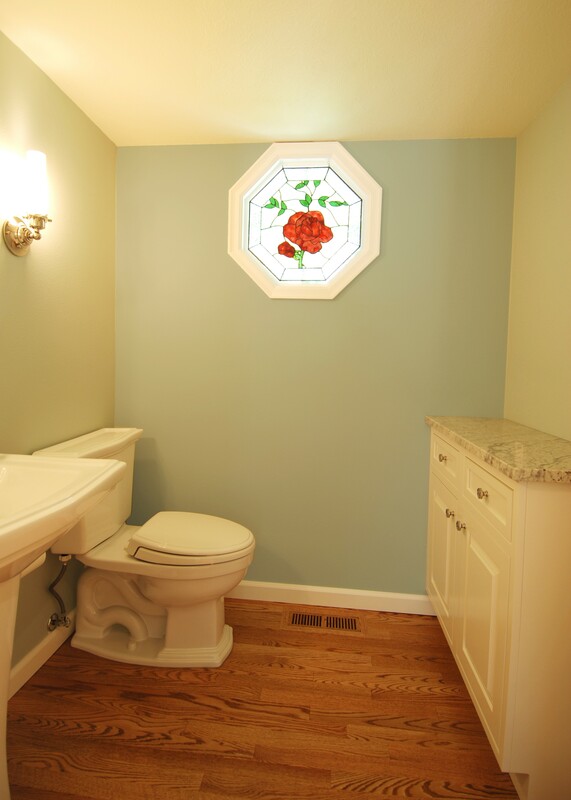 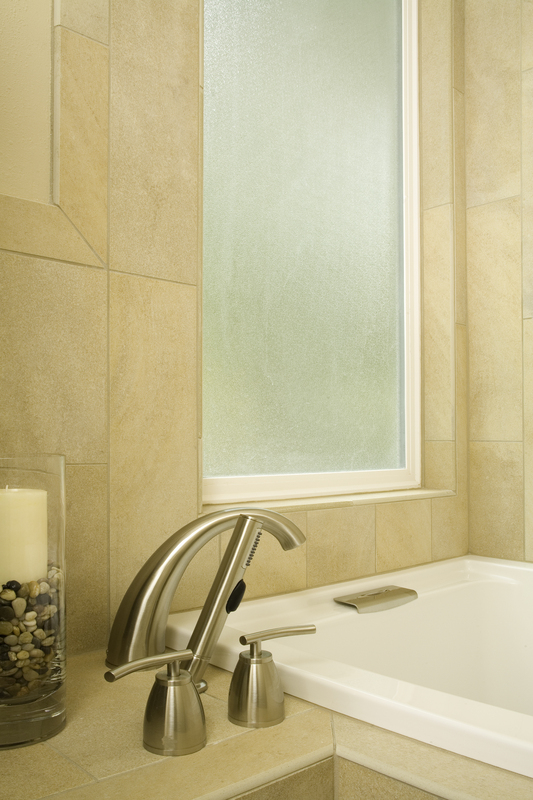 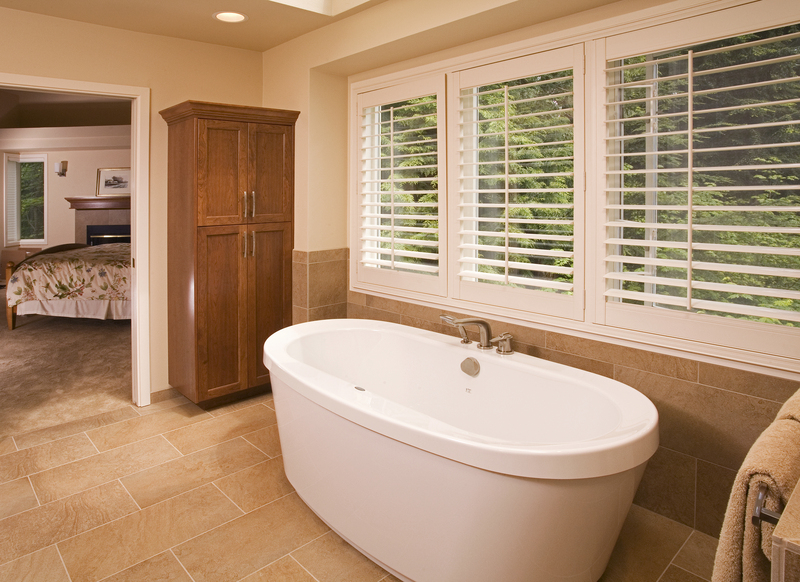 The beautiful stained glass window in this master bathroom sets the tone for the space. 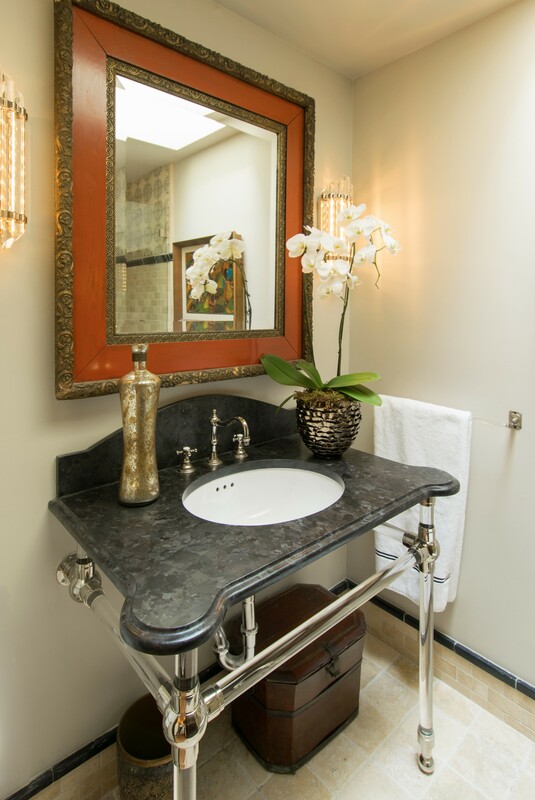 The arrangement of space focused on making every corner useful and the warm color palette, elegant tile work, and luxurious oil-rubbed bronze finishes complete the design. 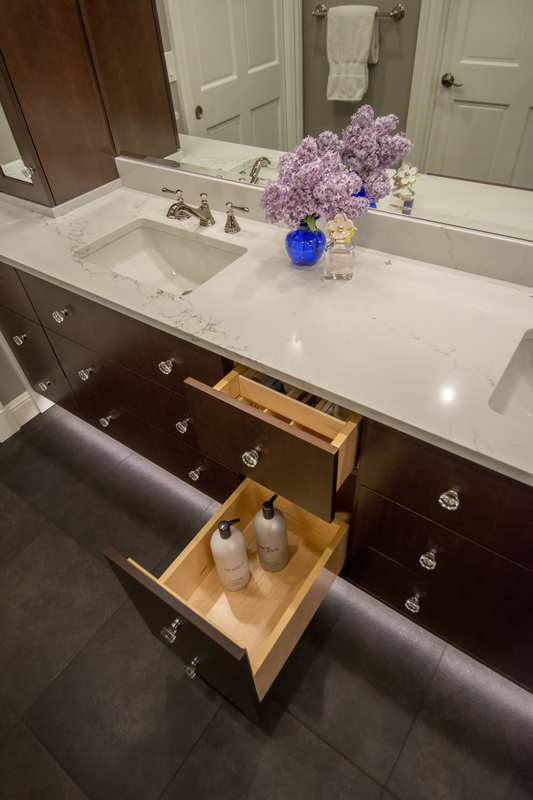 This award-winning master bathroom design focused on creating more storage in a small space while making it look and feel like an exquisite spa. 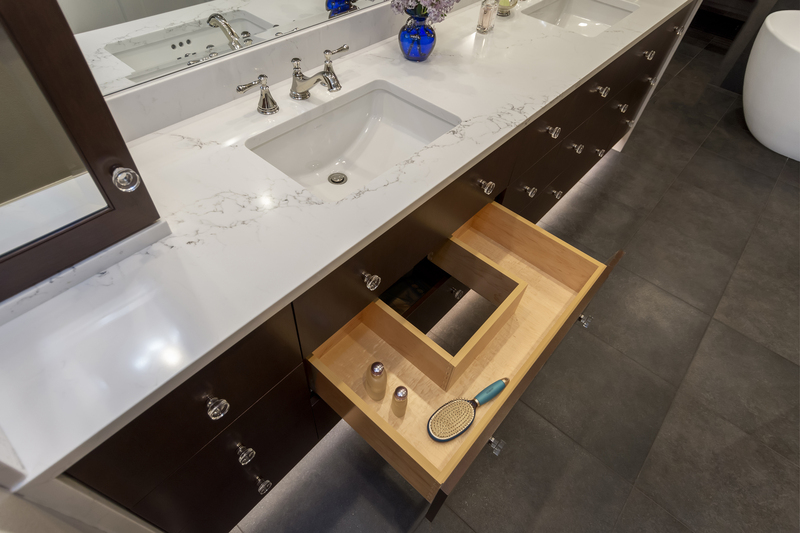 The vanity with tall storage on either side and wall mounted faucets allows for extra storage, and luxury shower fixtures including hand shower, rain shower, and fixed shower turn the small space into a personal spa. 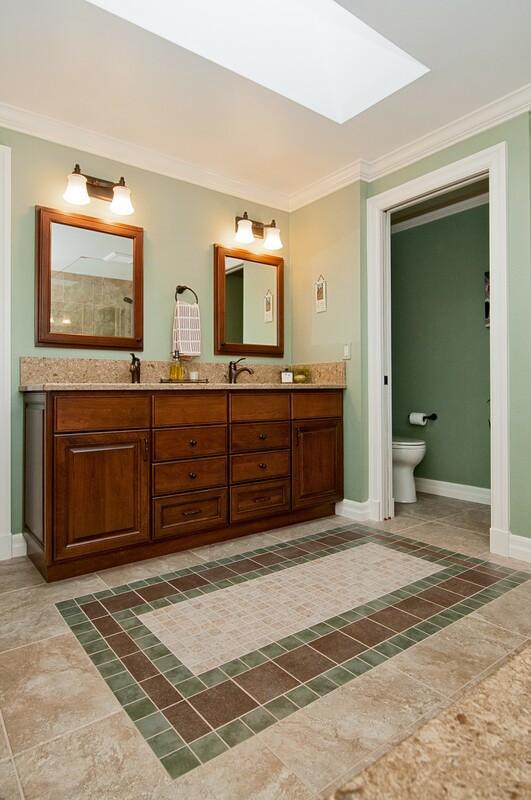 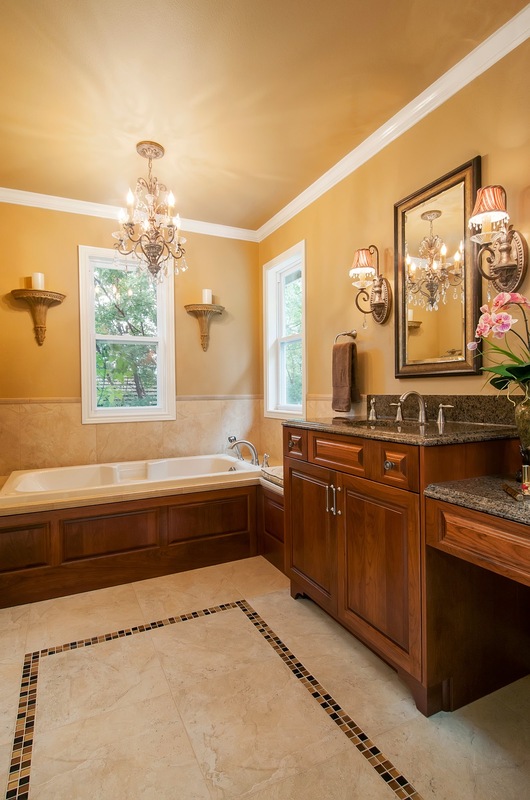 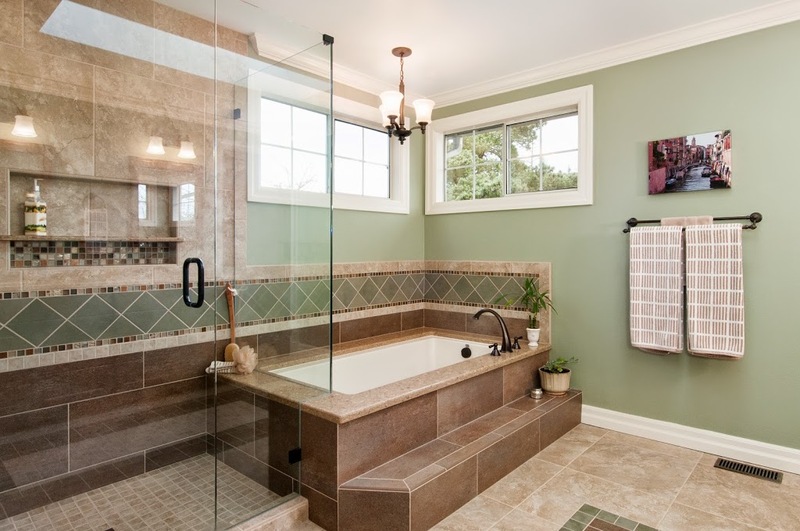 In this hall bath, the design is all about rich color tones and detailed tile work. 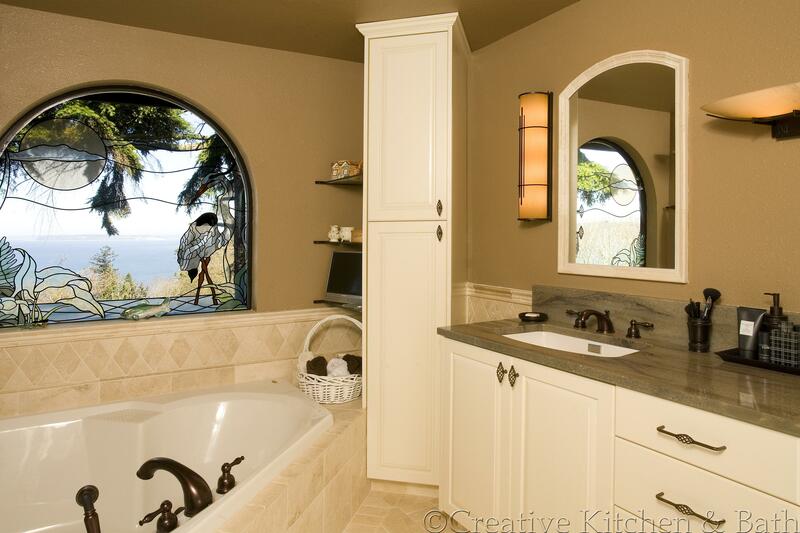 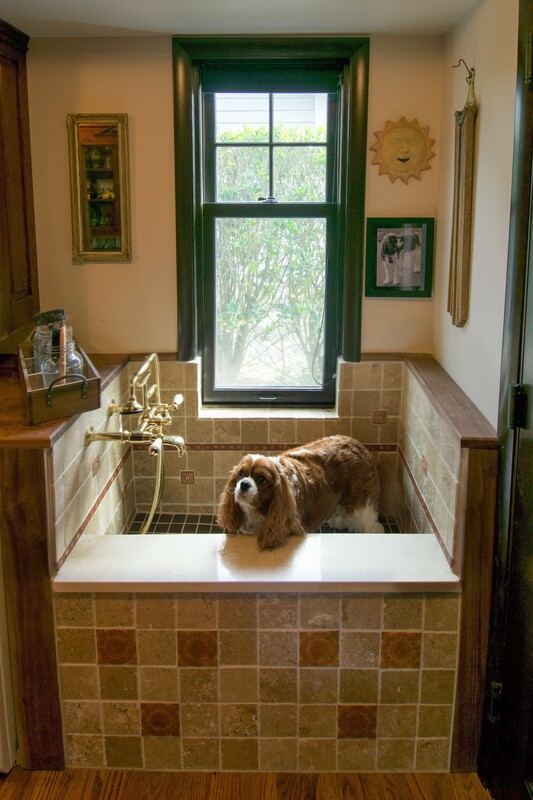 The intricate tile vanity backsplash is echoed in the tub surround. 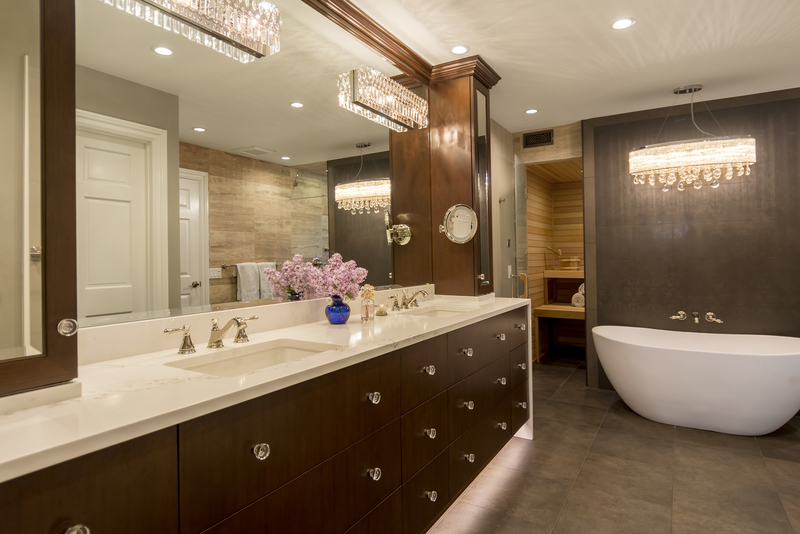 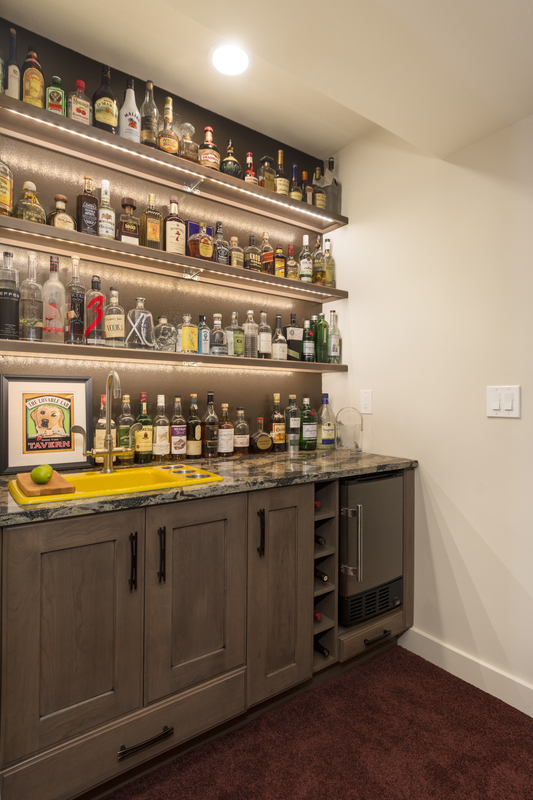 This, combined with details in the lighting, accessories, and in-set cabinets form a cohesive and luxurious space. 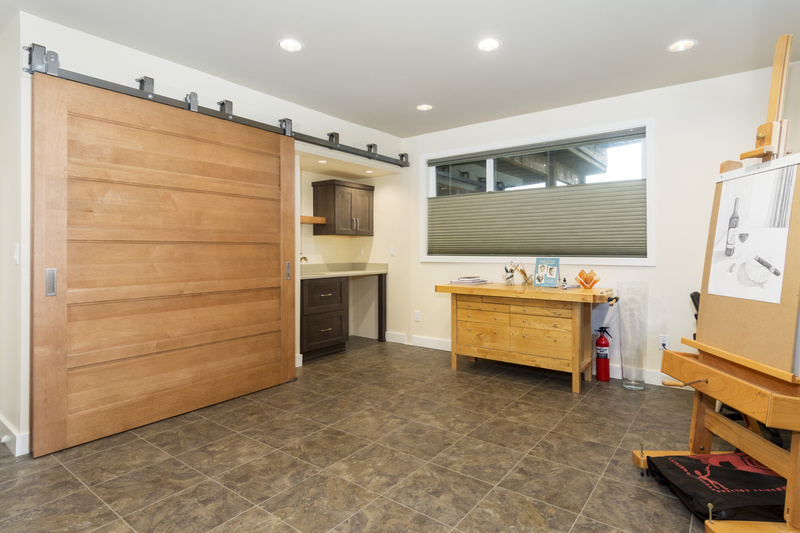 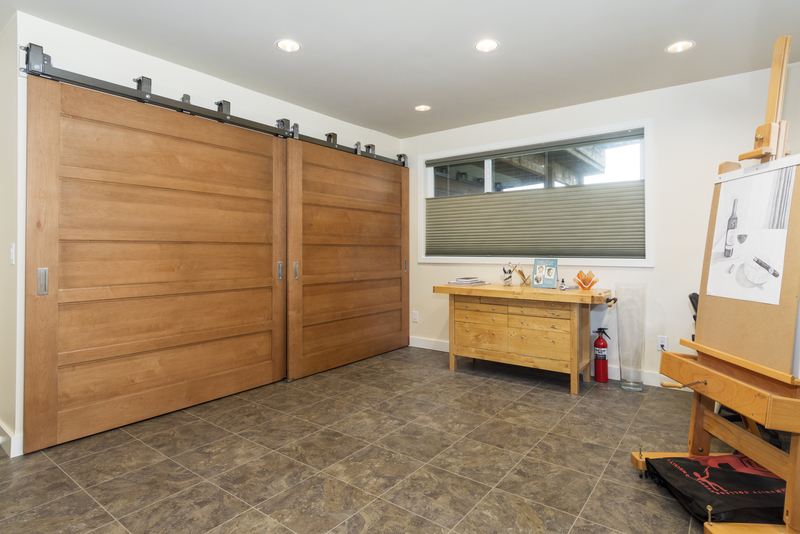 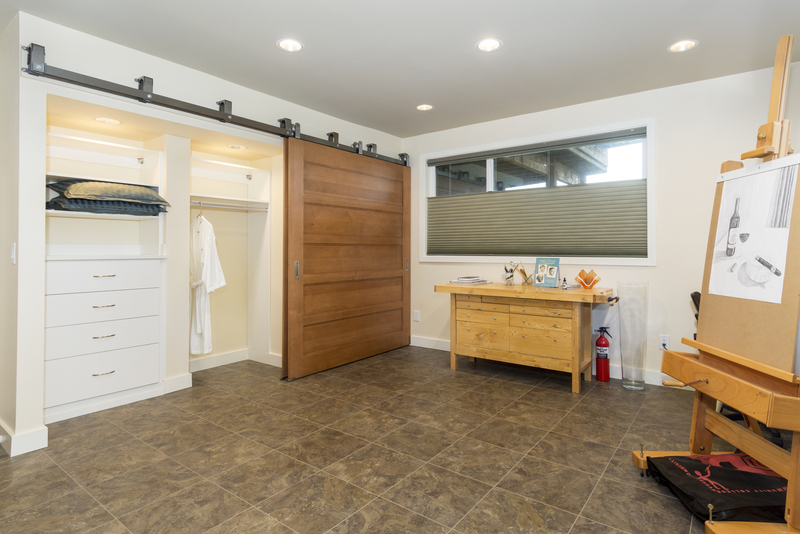 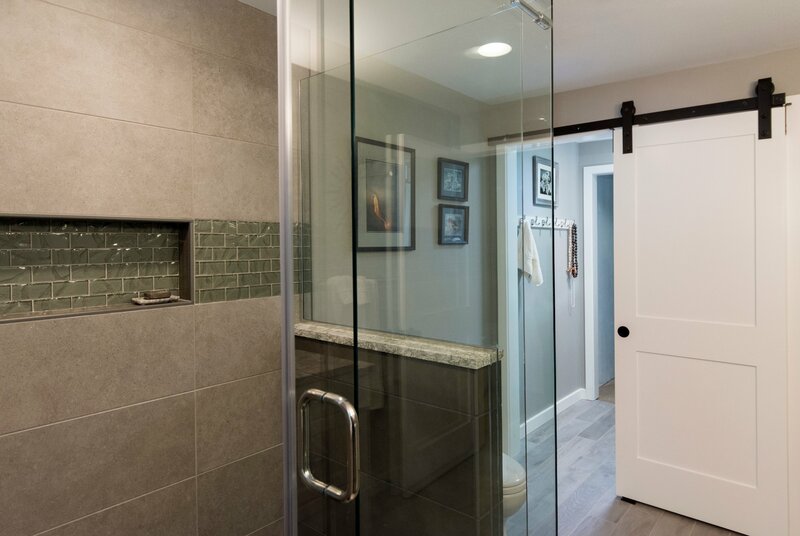 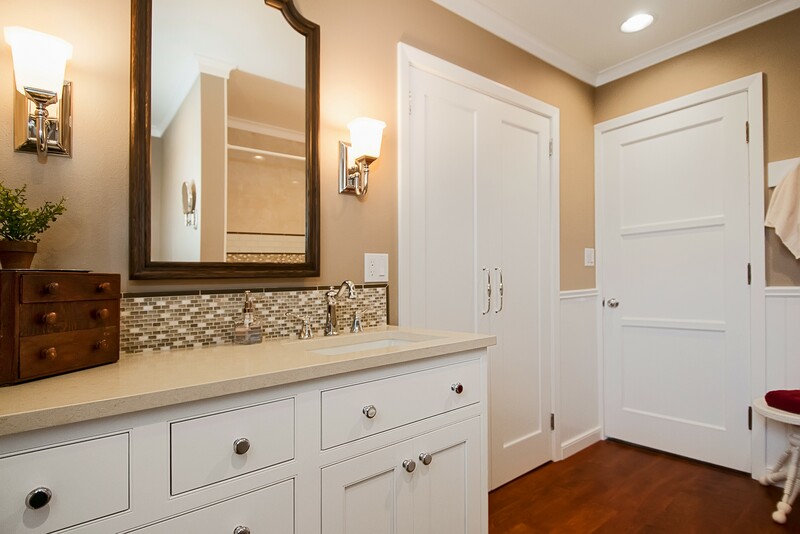 In an interesting master bathroom layout, one vanity is located across from the shower and the other vanity is in an adjacent space separated by a stylish barn door. 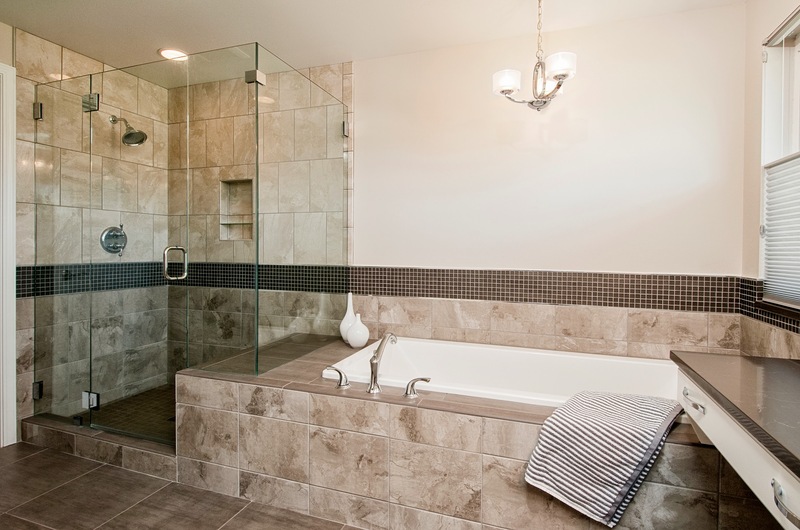 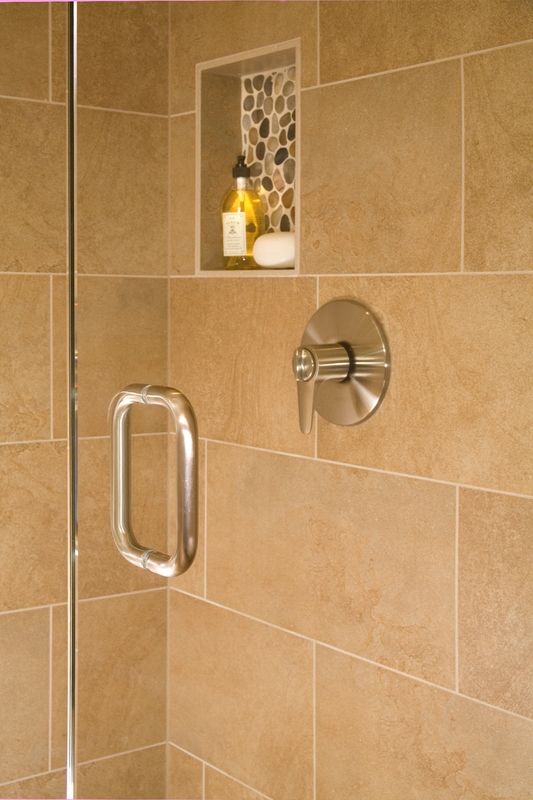 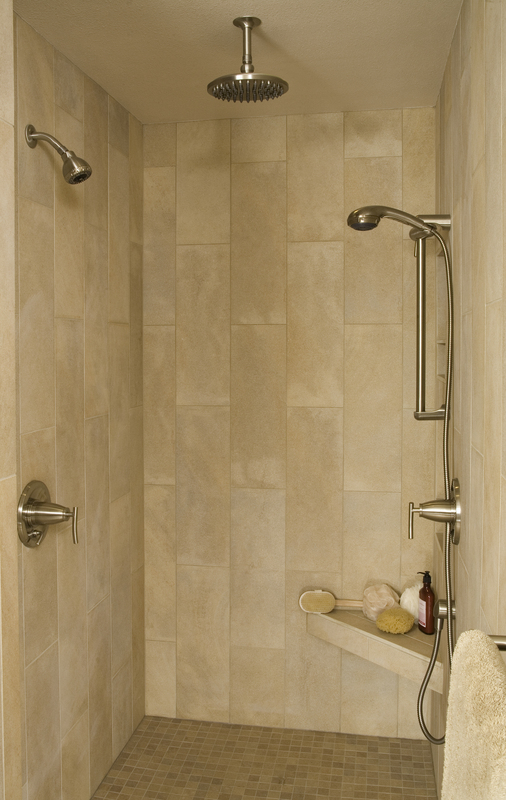 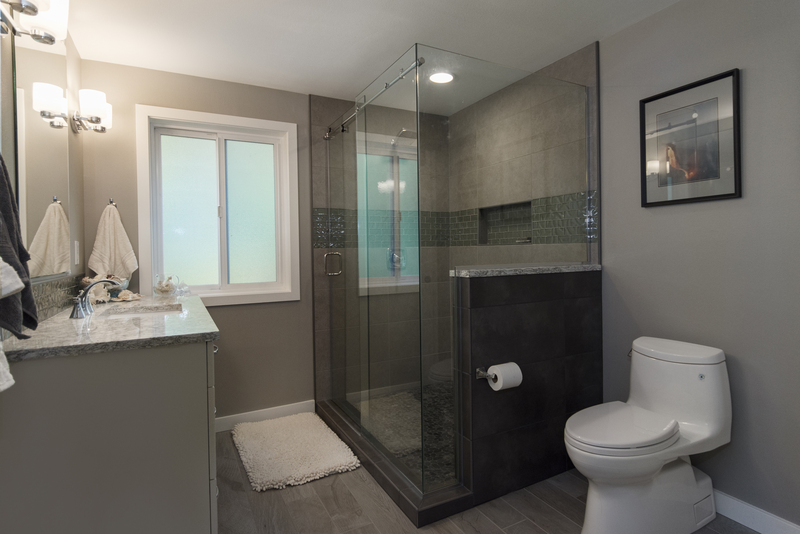 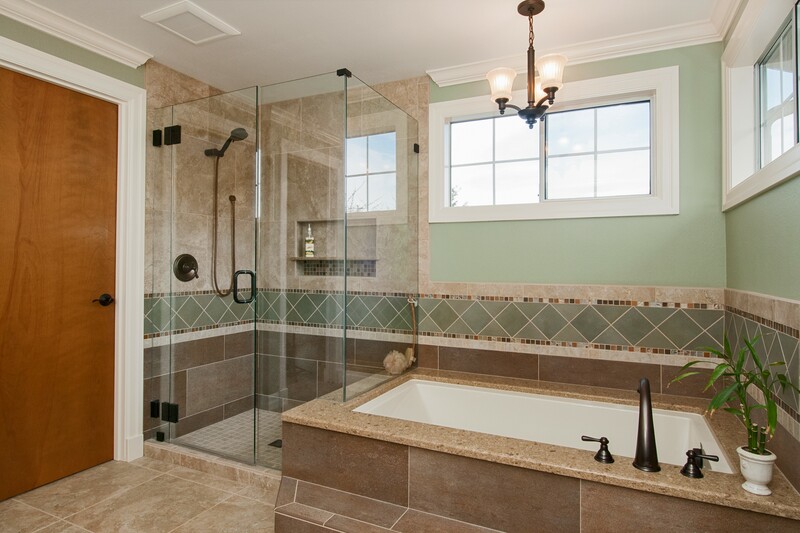 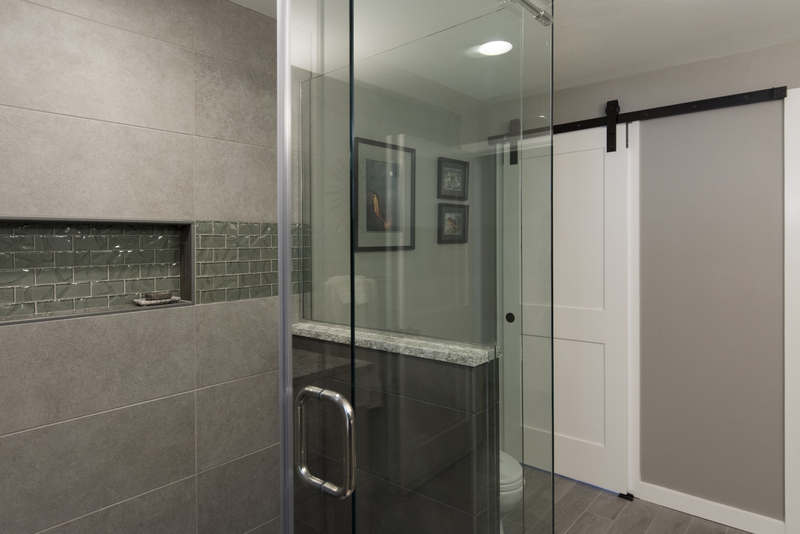 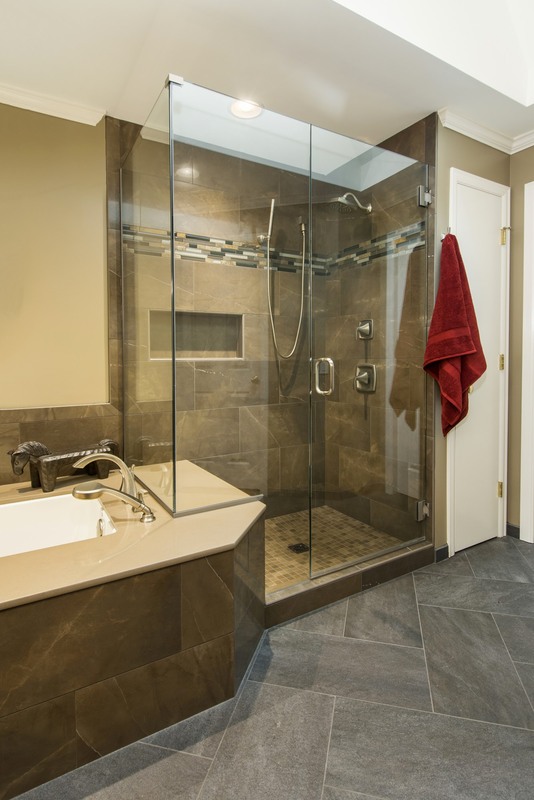 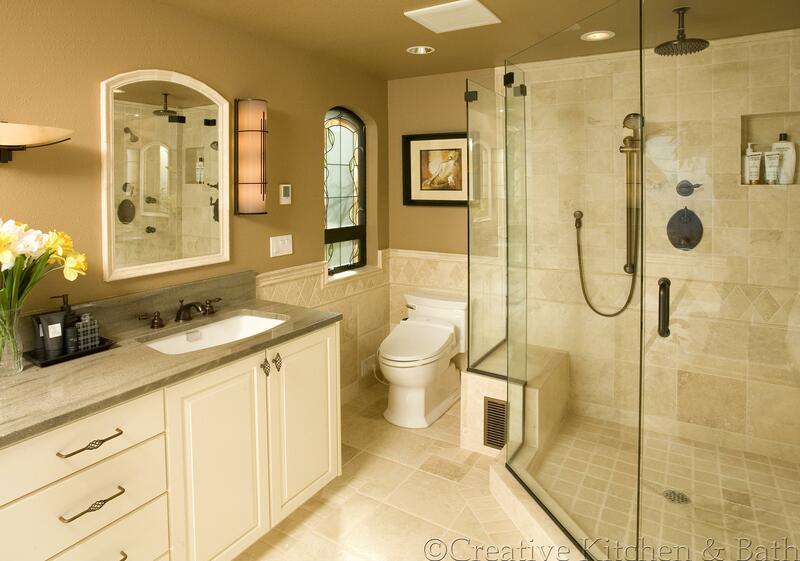 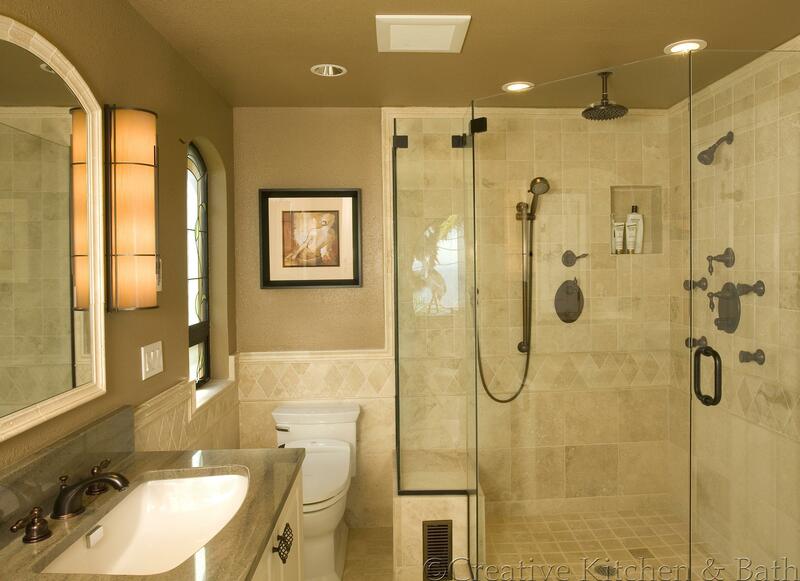 Accent lighting, glass tile, and a frameless track shower door are some of the many features of this space. 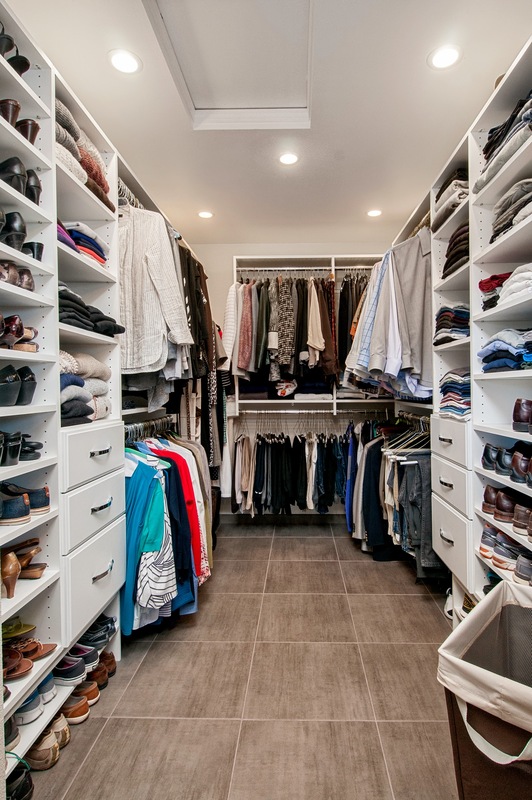 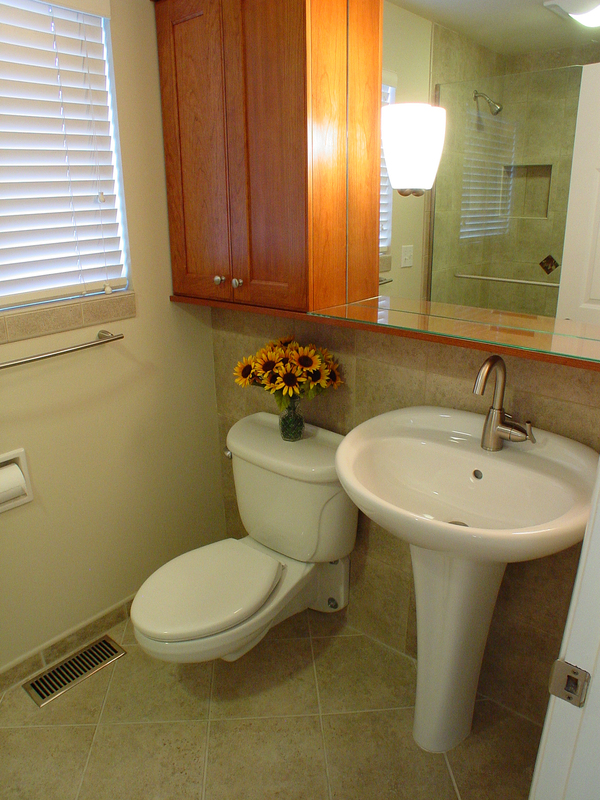 The small spaces can pack a big punch. 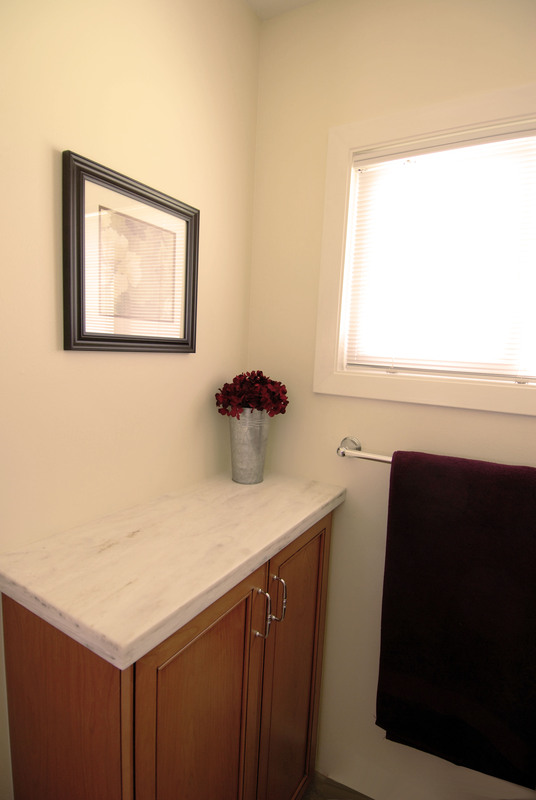 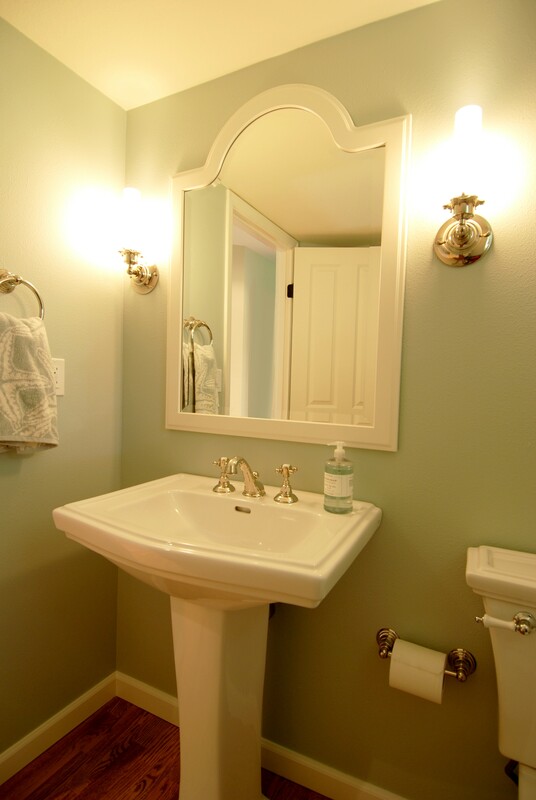 Here is a sampling of some small bathrooms and powder rooms in our portfolio. 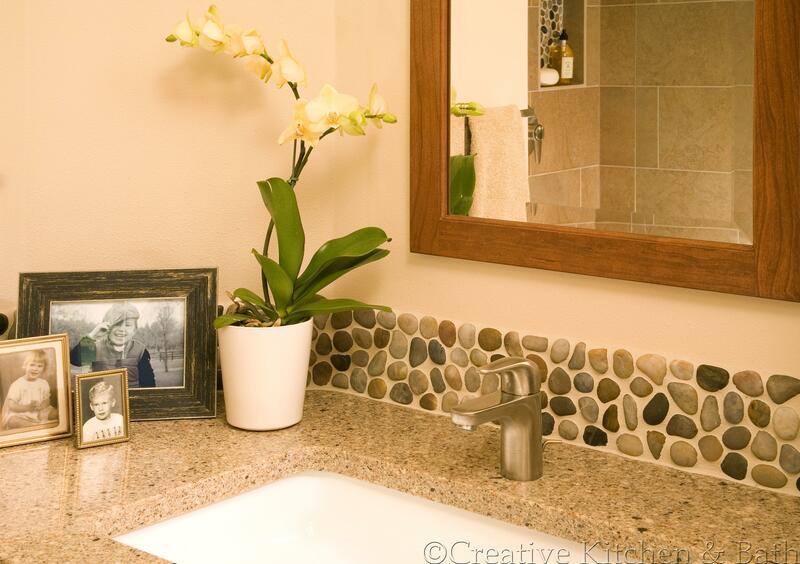 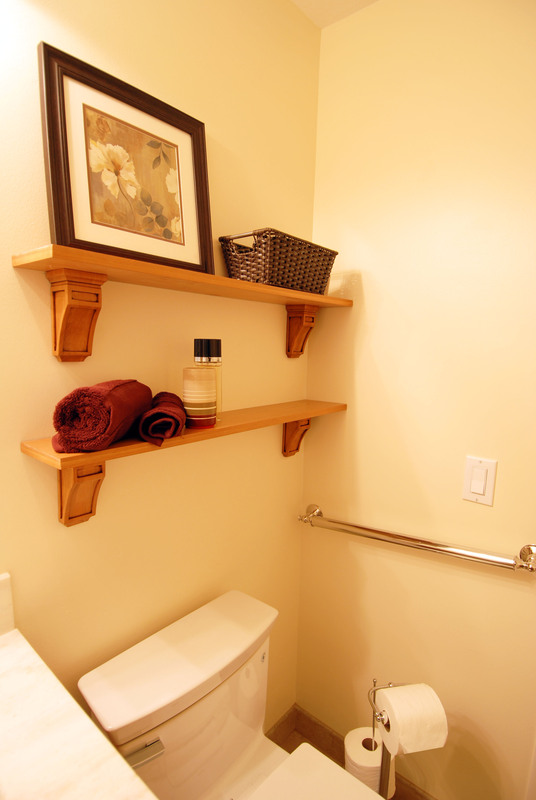 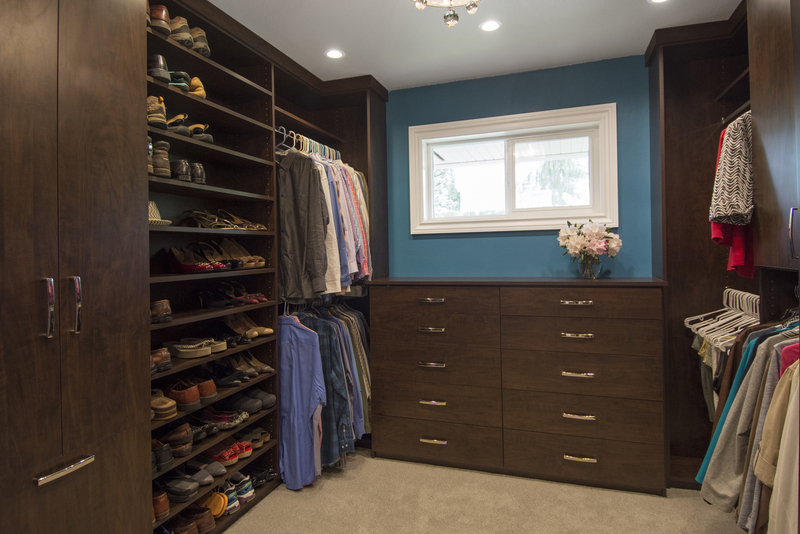 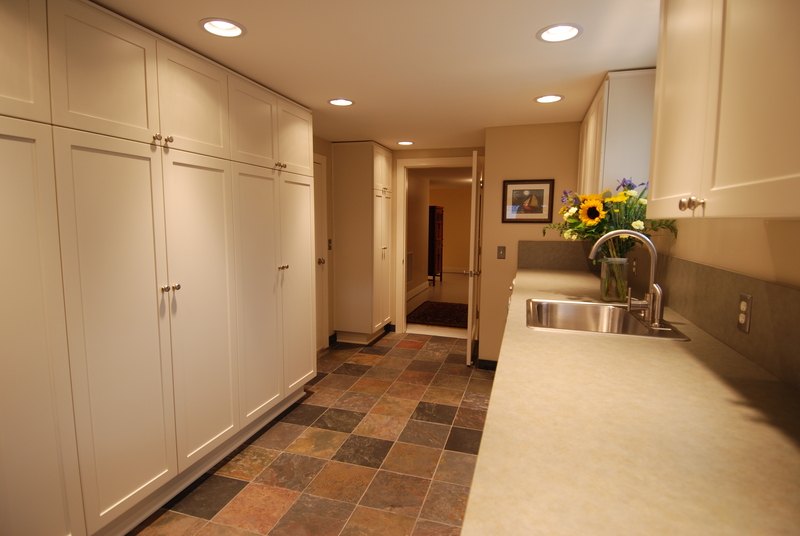 Beyond Kitchens & Baths, Creative can update all areas of the home. 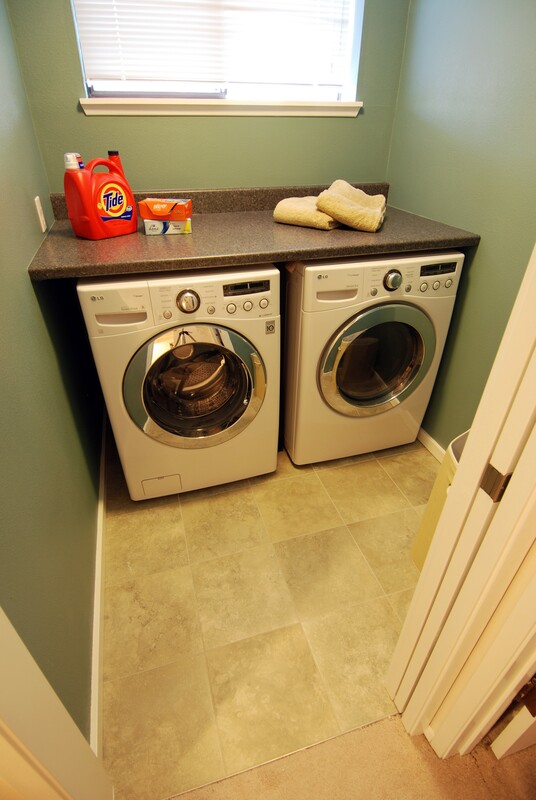 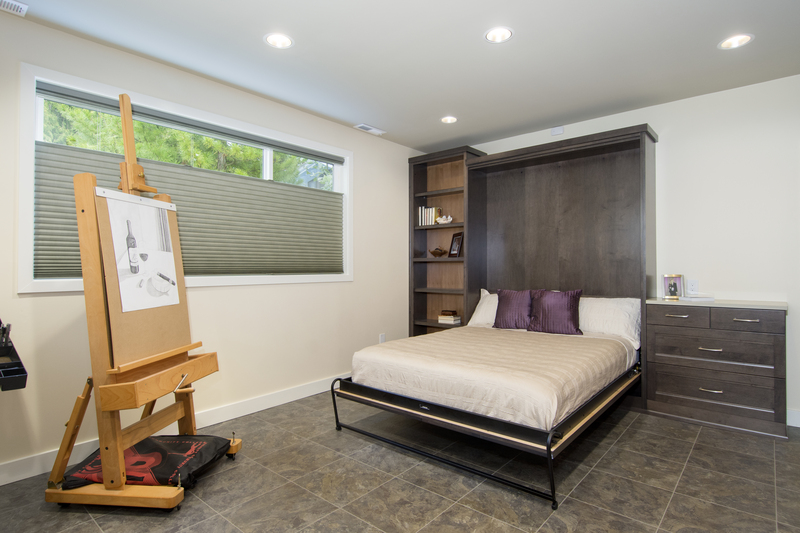 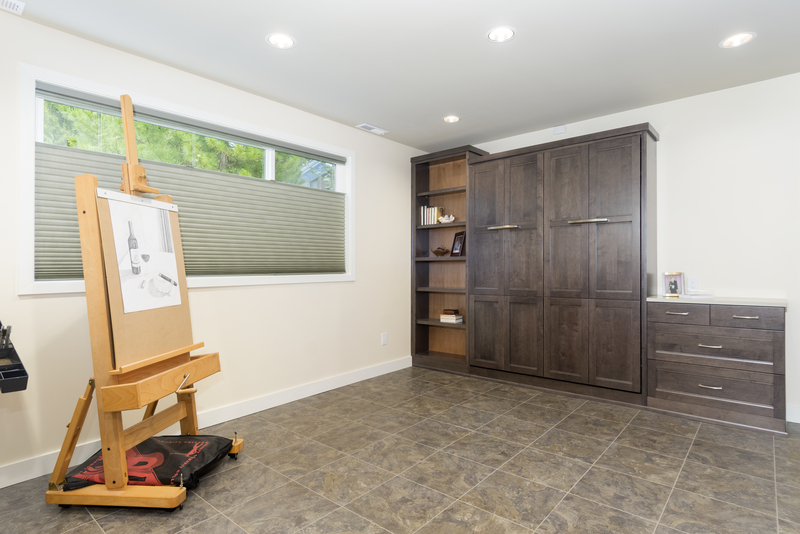 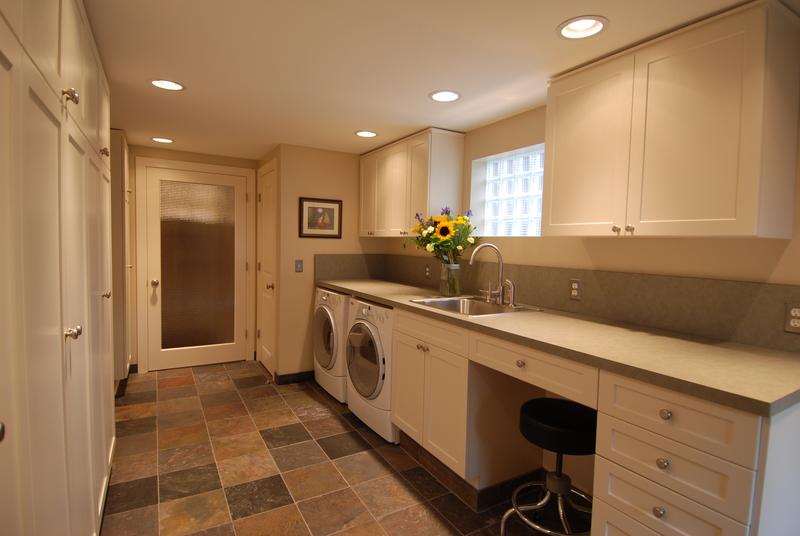 Some of the areas featured in our portfolio include art studios, bars, closets, laundry rooms, mud rooms, and dog-washes!